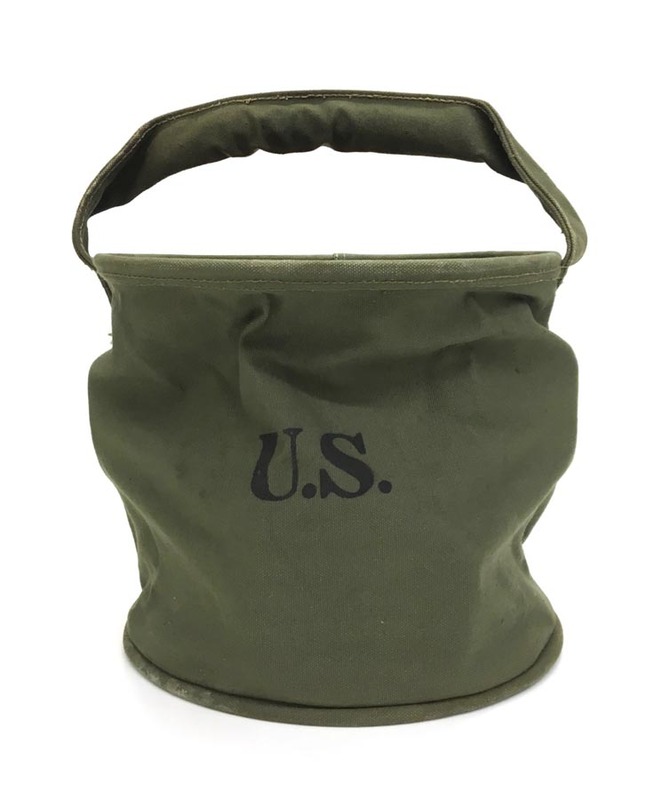 PHYSICAL DESCRIPTION: WW2 US collapsible water bucket in nice condition with no holes or tears. 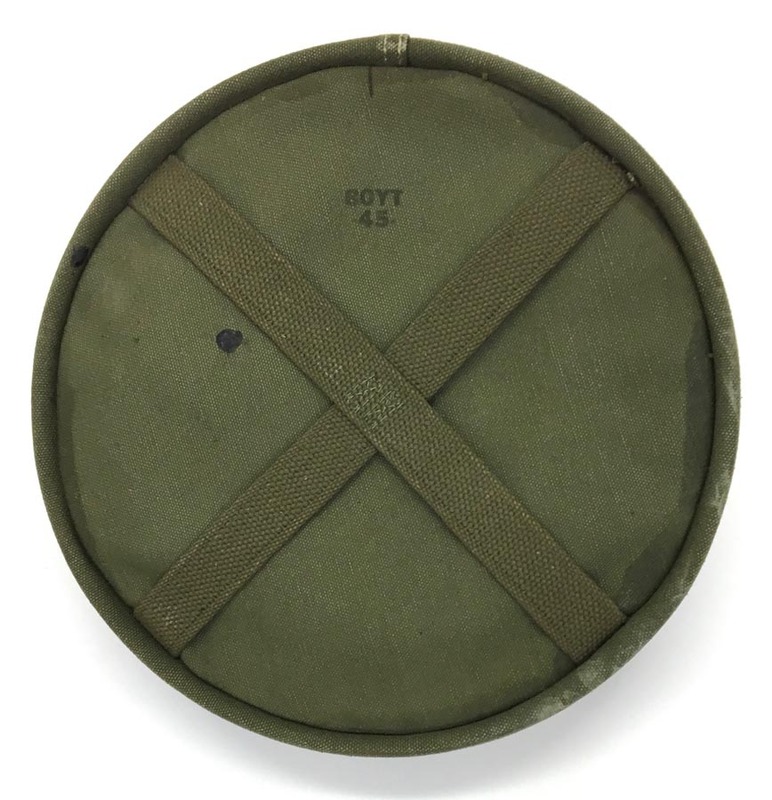 Bucket is canvas materiel and is marked to bottom, Boyt 45. 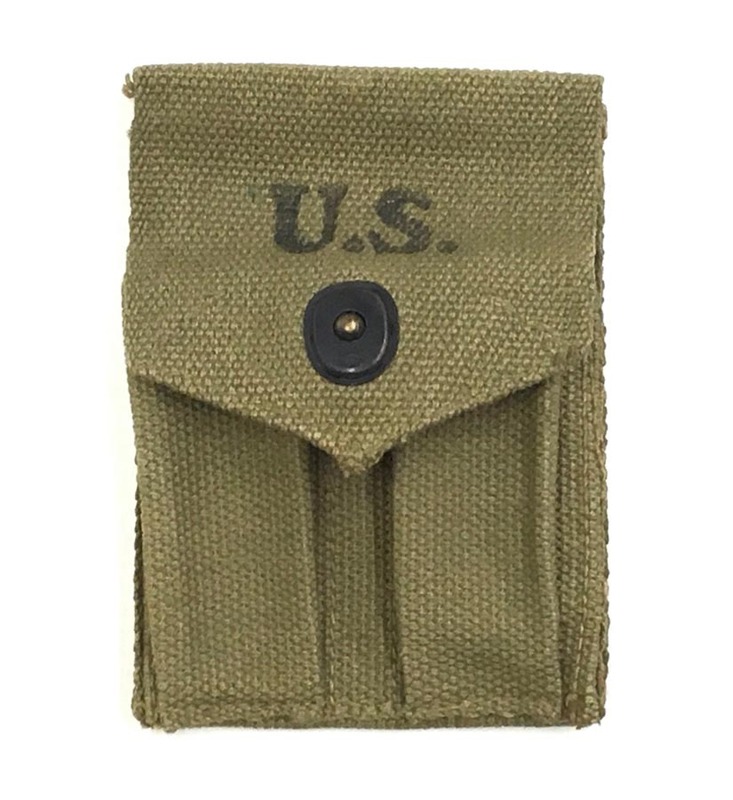 PHYSICAL DESCRIPTION: WW2 M1911 magazine pouch is in excellent unissued condition. 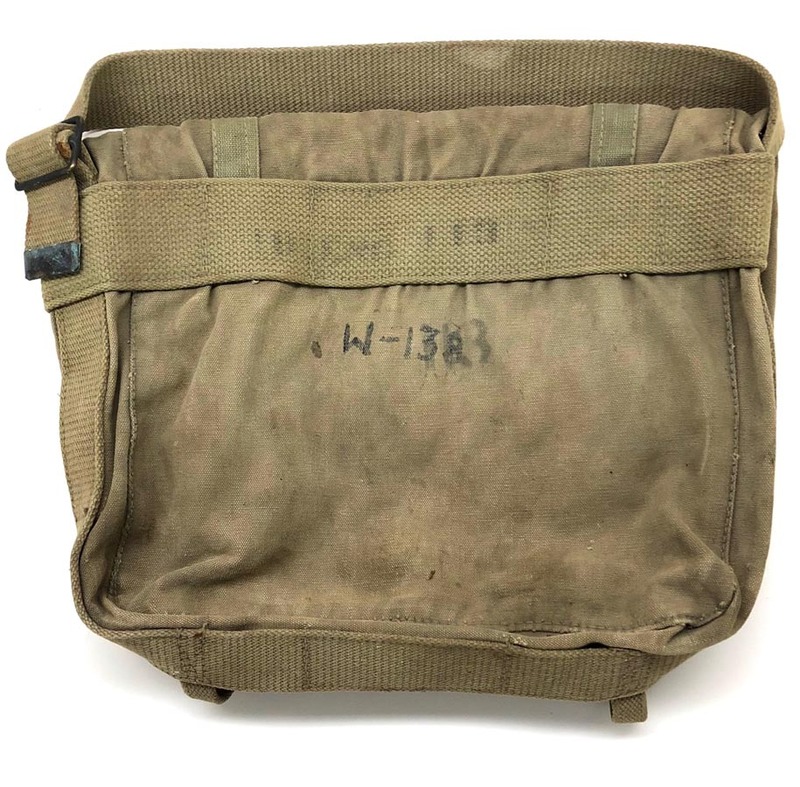 Pouch is marked Hoff Mfg. 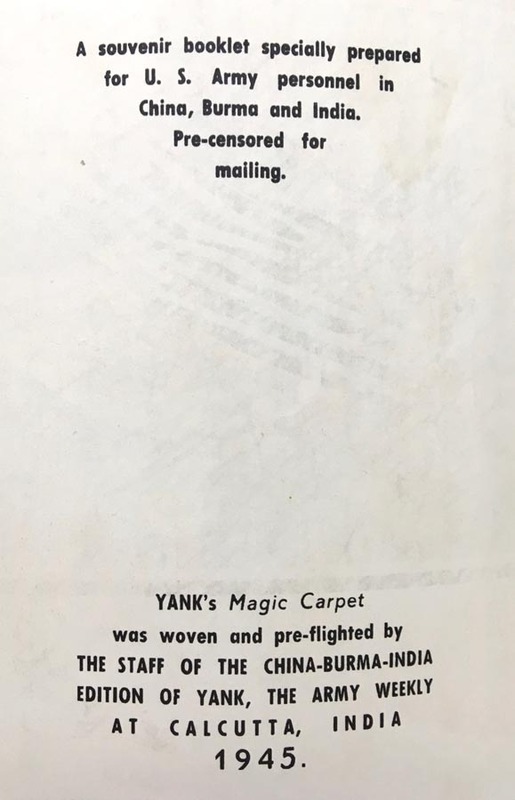 Co. and dated 1942. 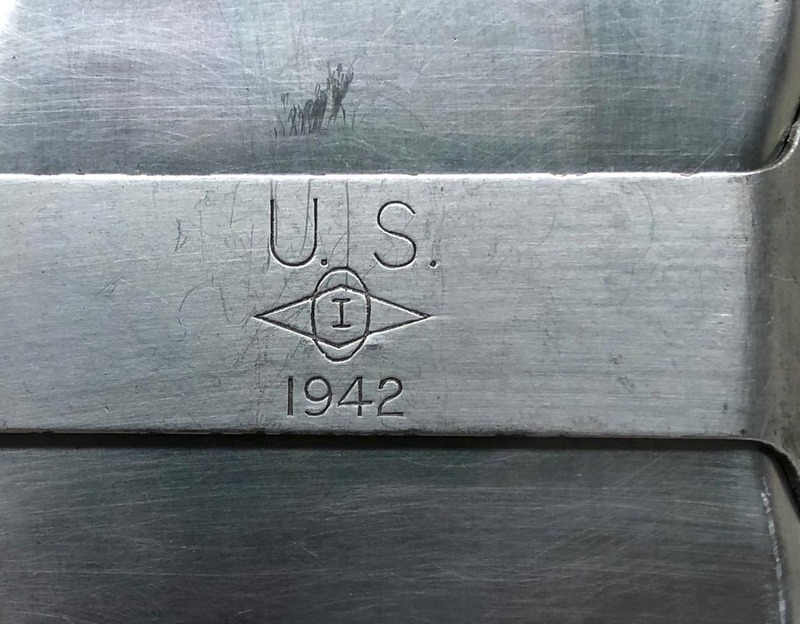 PHYSICAL DESCRIPTION: This WW2 Navy sweetheart coin bracelet is in nice condition. 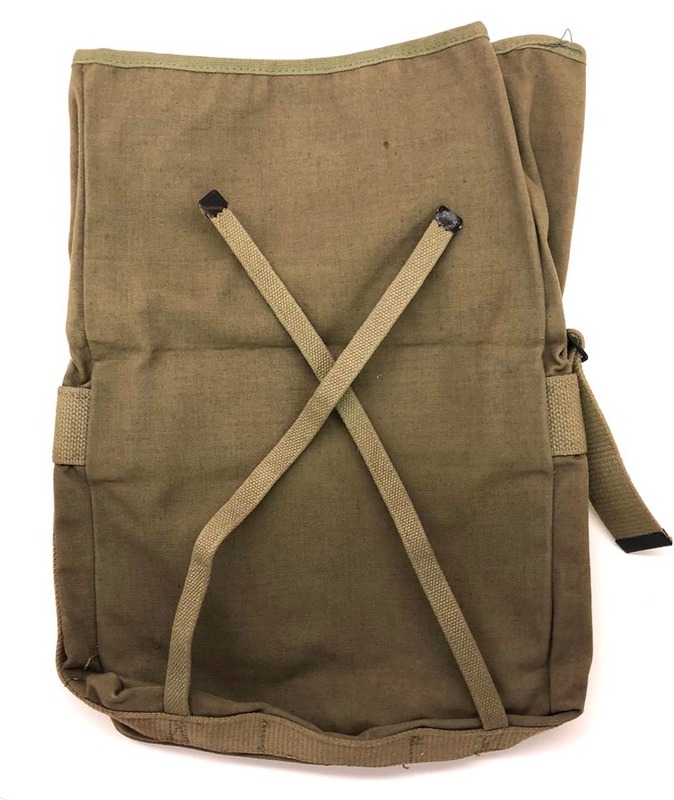 One attachment link towards the end has been replaced. 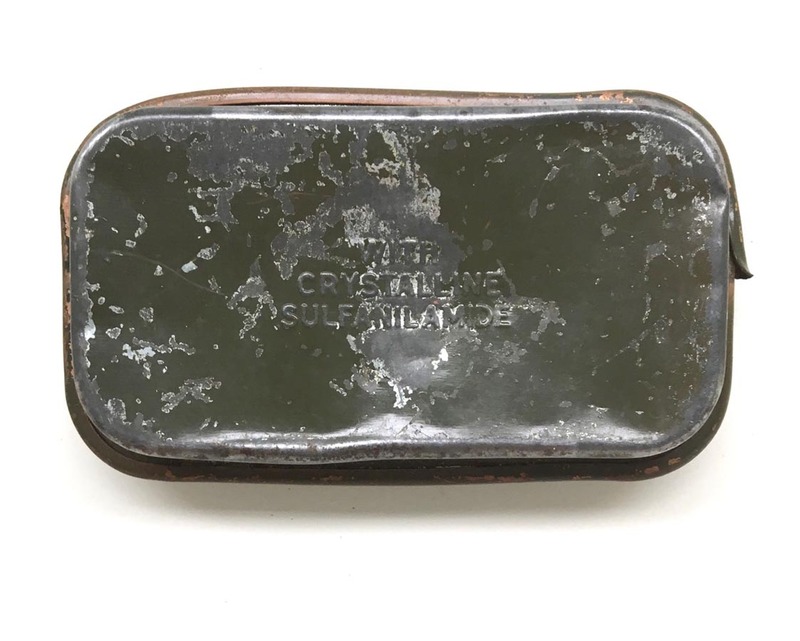 Bracelet measures 8 1/4 inches in length and is made up of British and Australian silver coins. 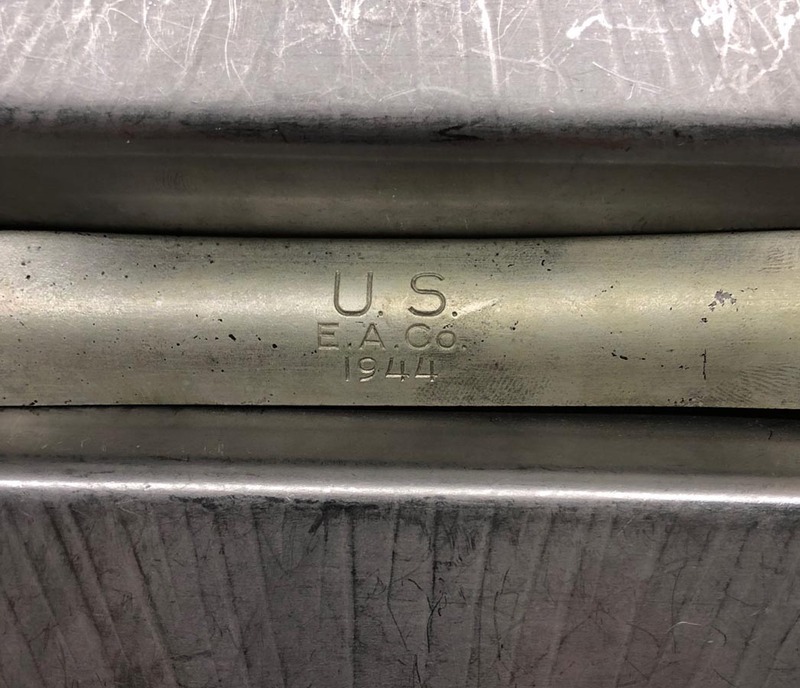 All coins are pre 1945 dated. 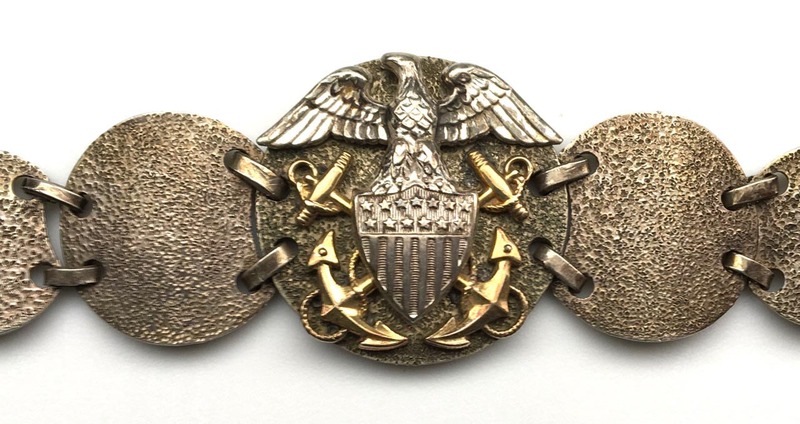 The bracelet has a WW2 Naval Officers cap badge applied to center. 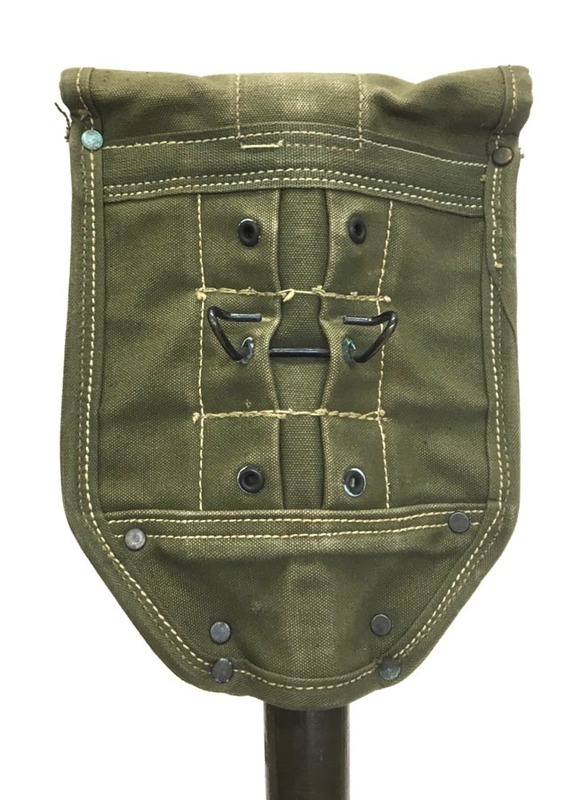 Even the buckle fasteners are made from coins. 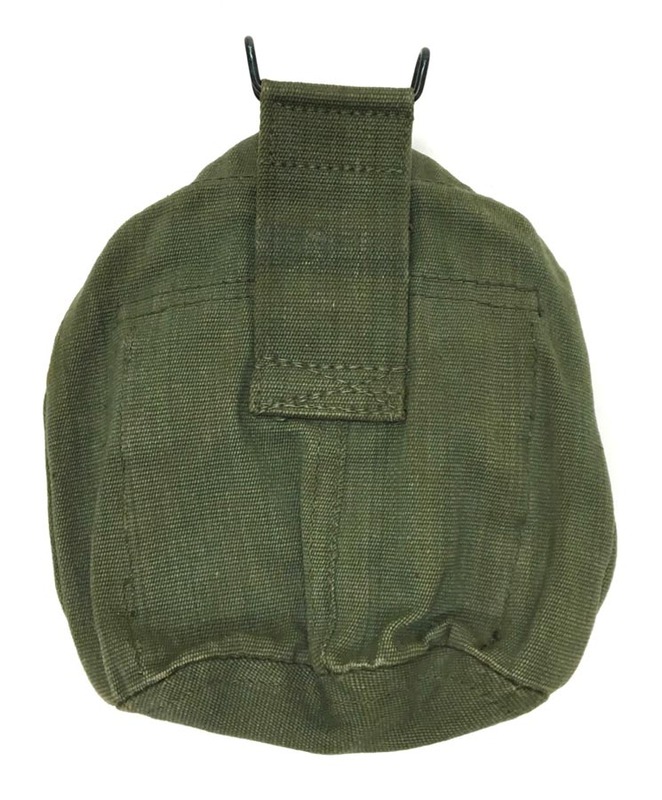 PHYSICAL DESCRIPTION: This WW2 British canteen cover is in excellent condition with no damage. 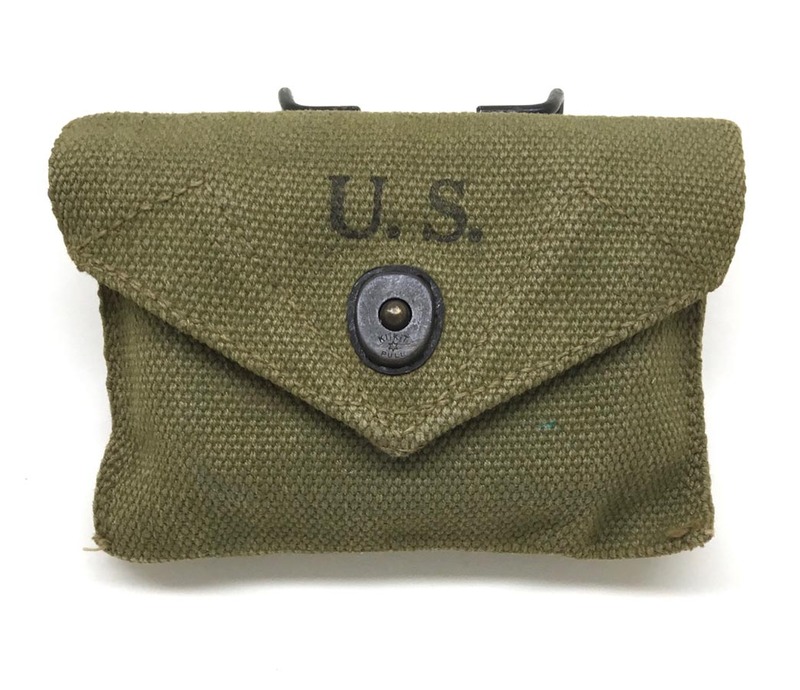 Cover is 1945 dated with British Broad Arrow mark. 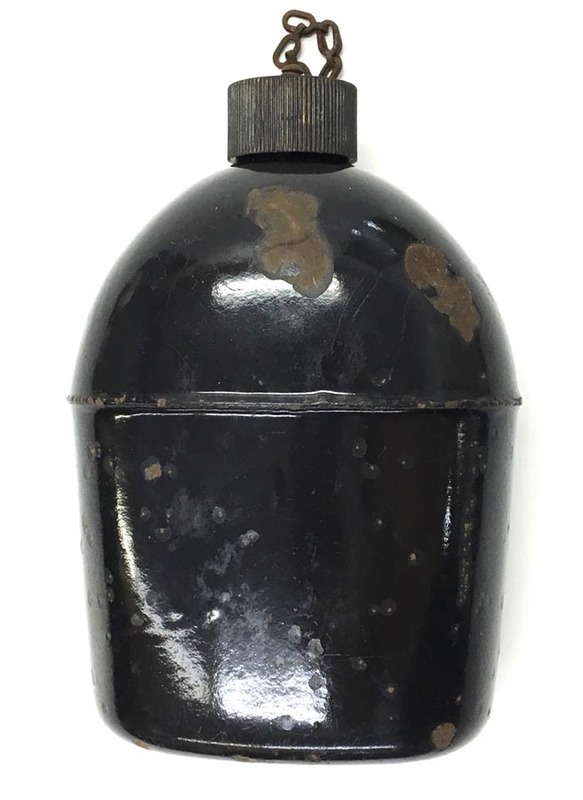 PHYSICAL DESCRIPTION: Scarce black porcelain canteen in fair condition showing some age and wear. 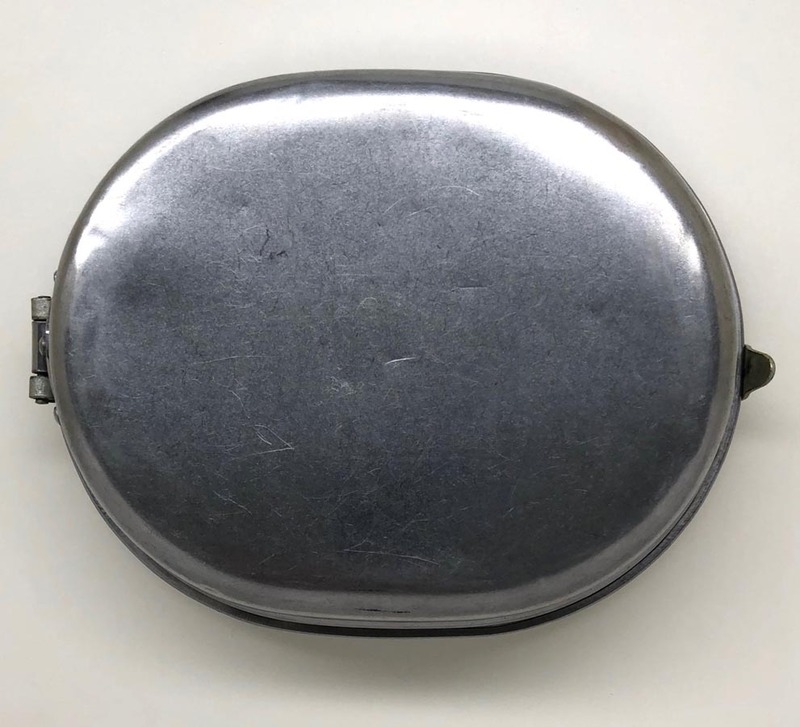 Canteen does have several chips to porcelain and is dated 1942 to bottom. 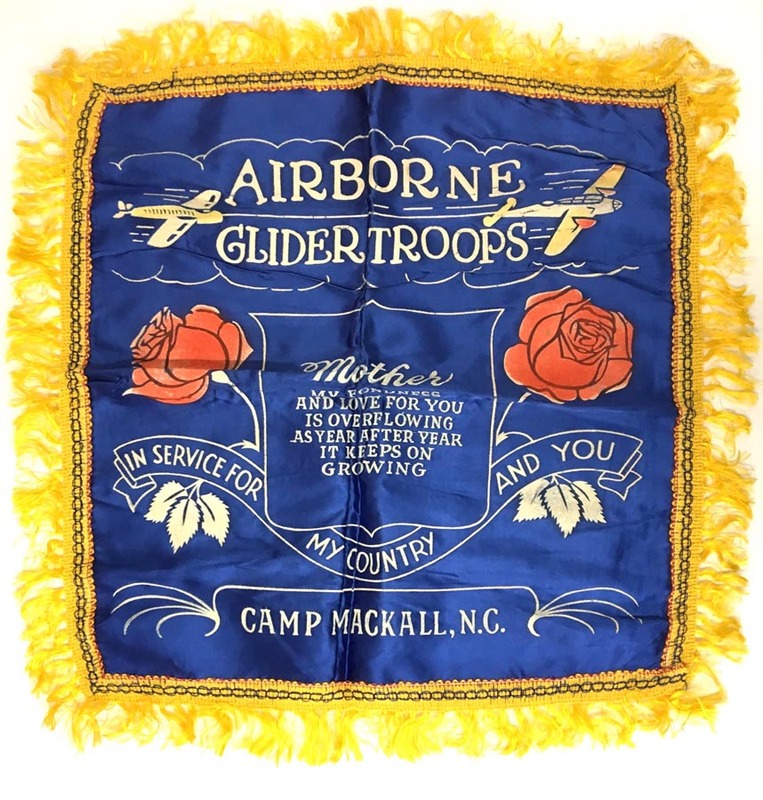 PHYSICAL DESCRIPTION: This Airborne Glider Troops Pillow Case is in real nice condition showing some light age. 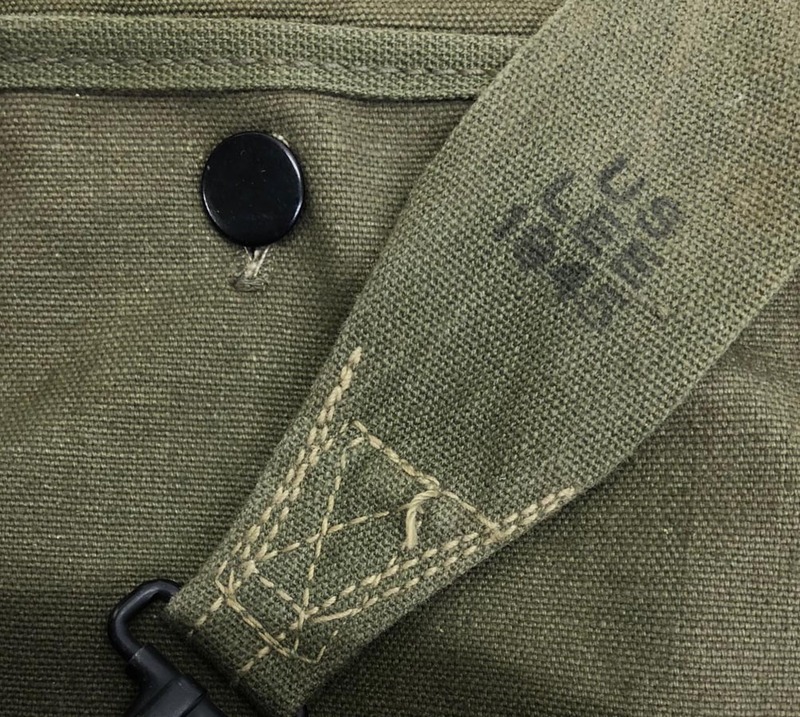 There are no rips or holes and most of the flocking is still present. 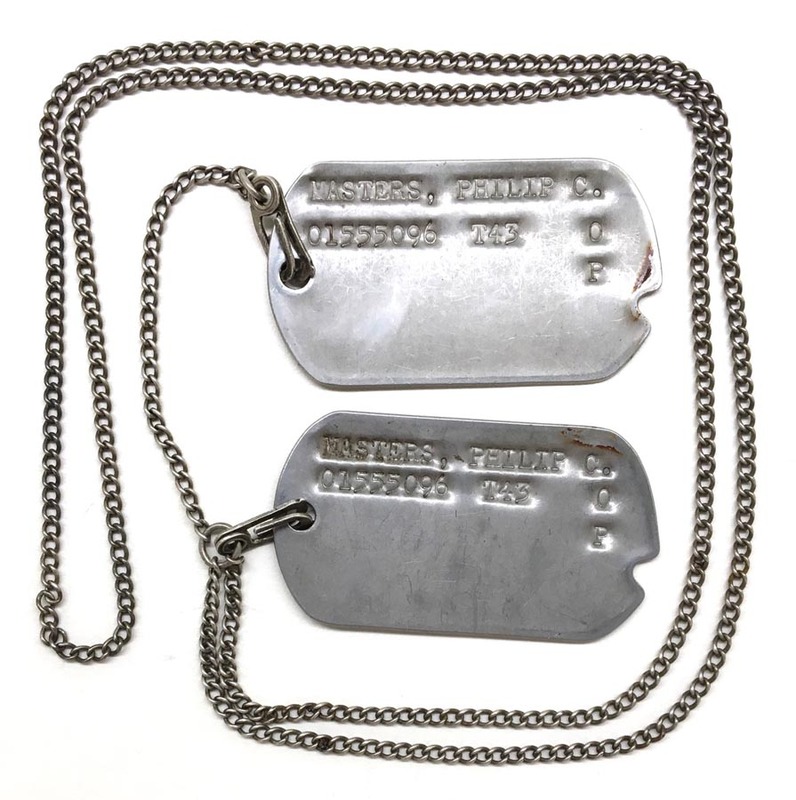 PHYSICAL DESCRIPTION: This set of WW2 Dog Tags on a private purchase sterling chain show some wear but are in nice condition with no problems. 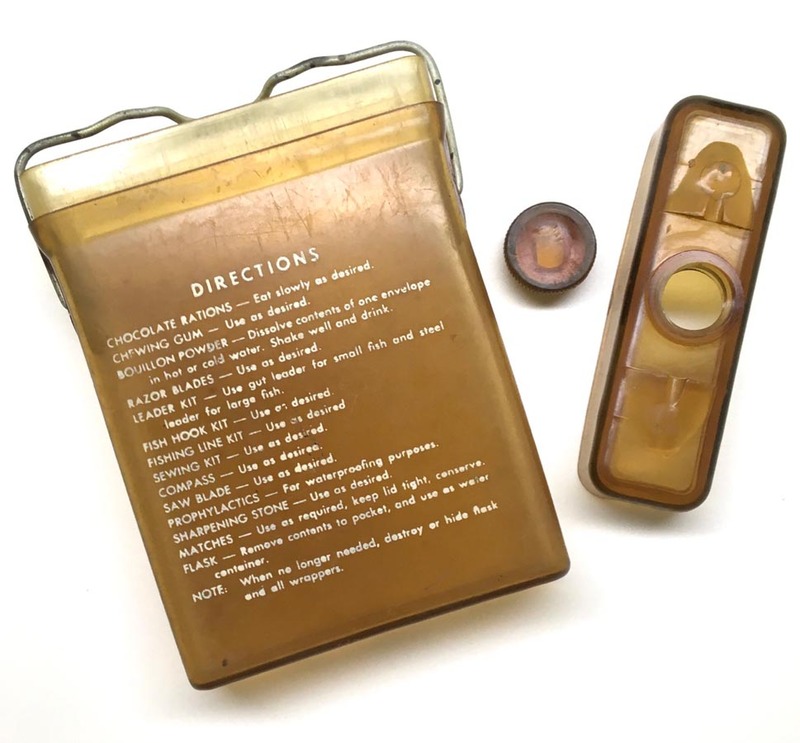 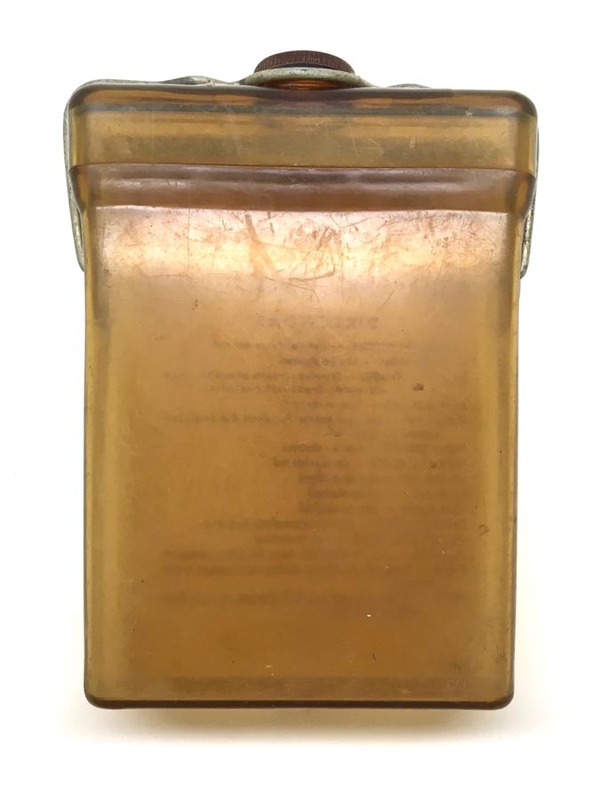 PHYSICAL DESCRIPTION: This WW2 USAAF Type E-17 Aviation Survival Kit Flask is in real nice condition. 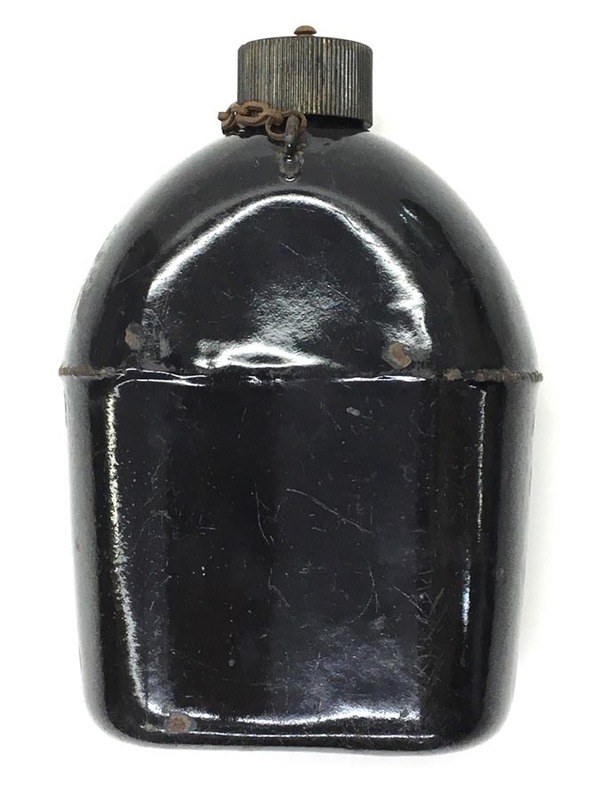 Flask comes apart like it was new. 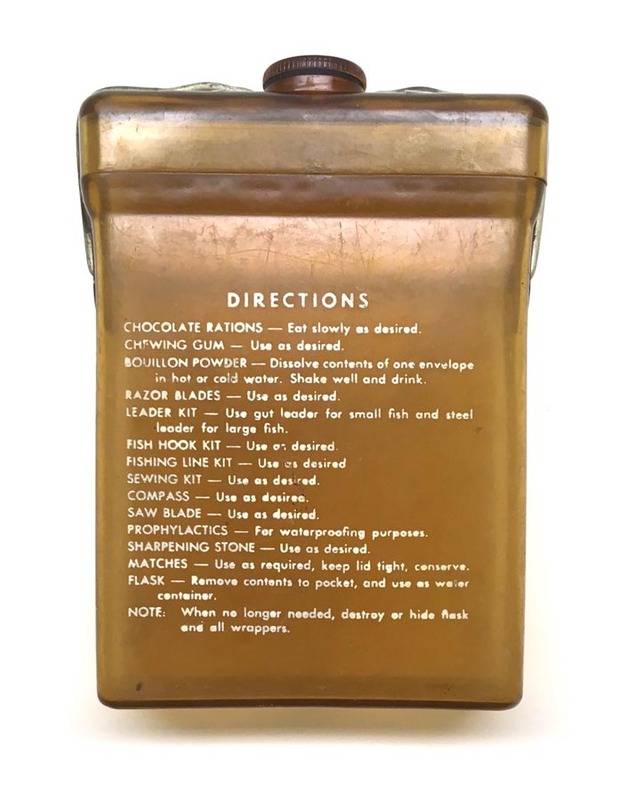 All lettering to front of flask is intact and readable. 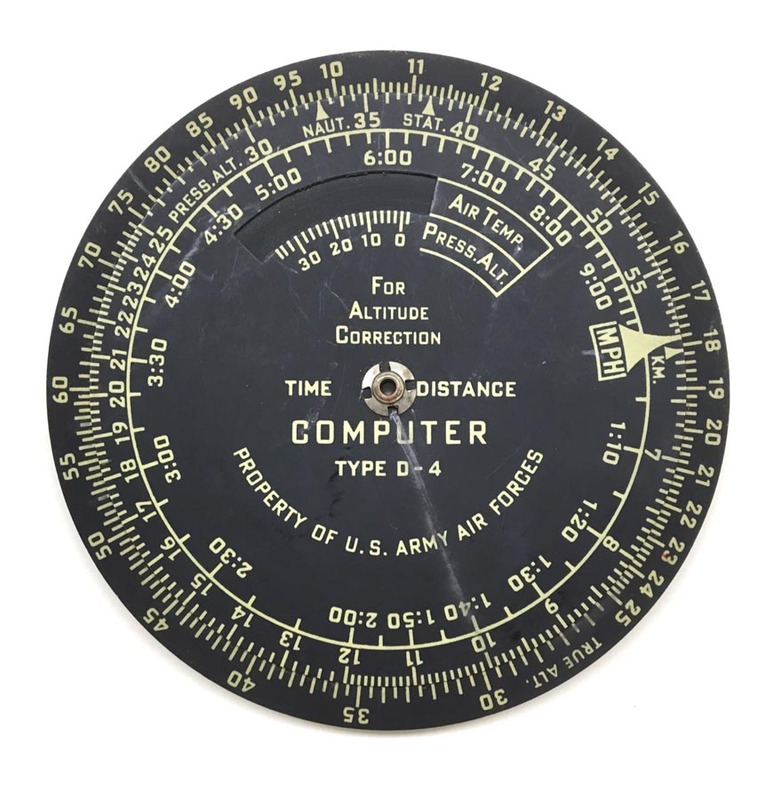 PHYSICAL DESCRIPTION: This WW2 USAAF Type D-4 Time & Distance Computer is in nice working condition showing some light wear. 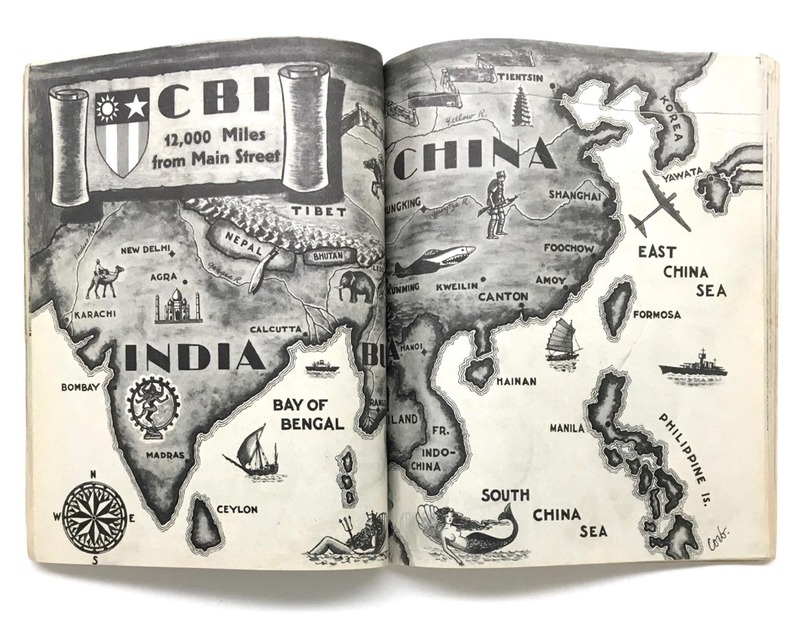 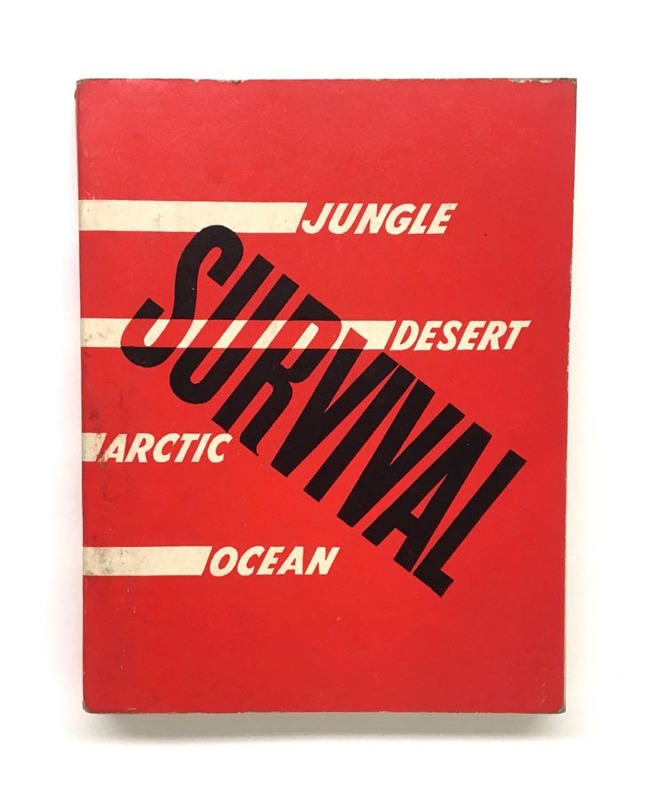 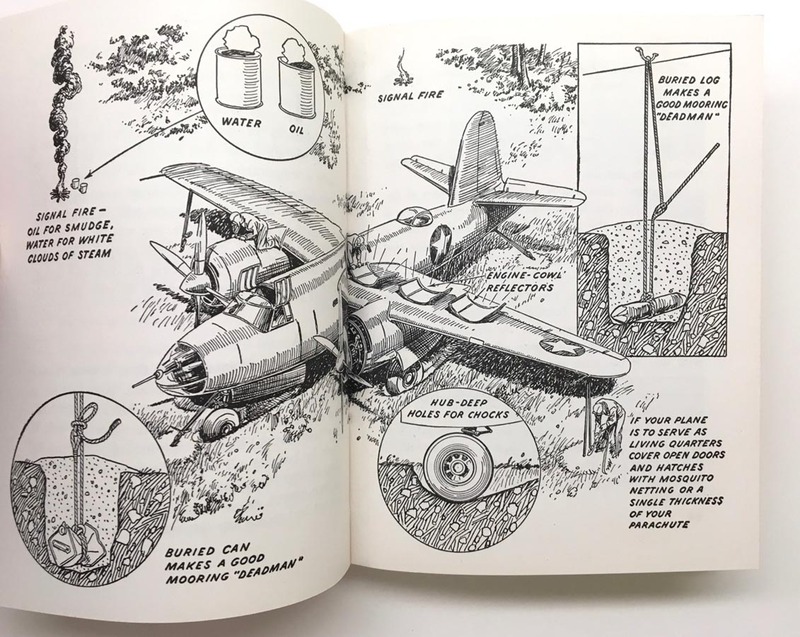 PHYSICAL DESCRIPTION: This WW2 USAAF Survival Manual is in excellent condition. 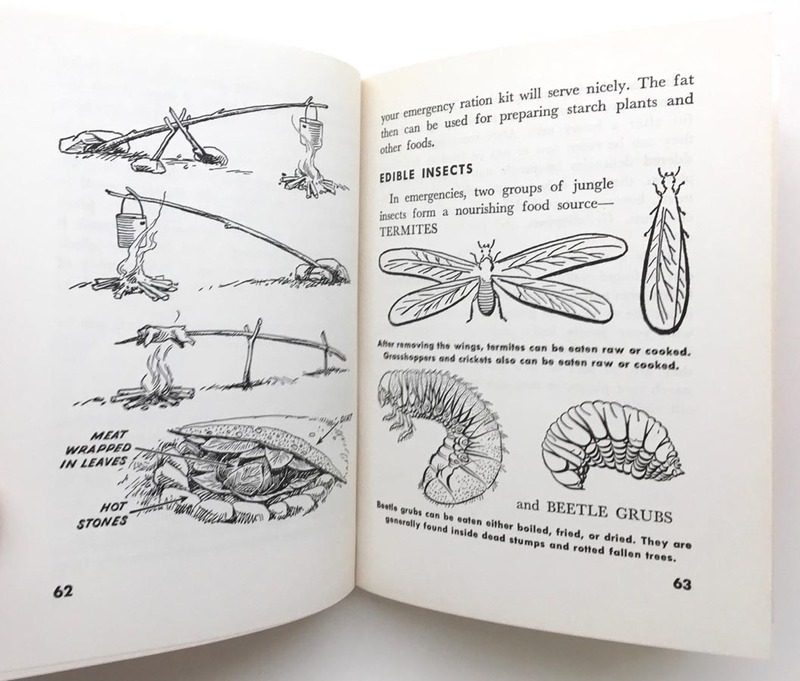 There are no tears or dog eared pages. 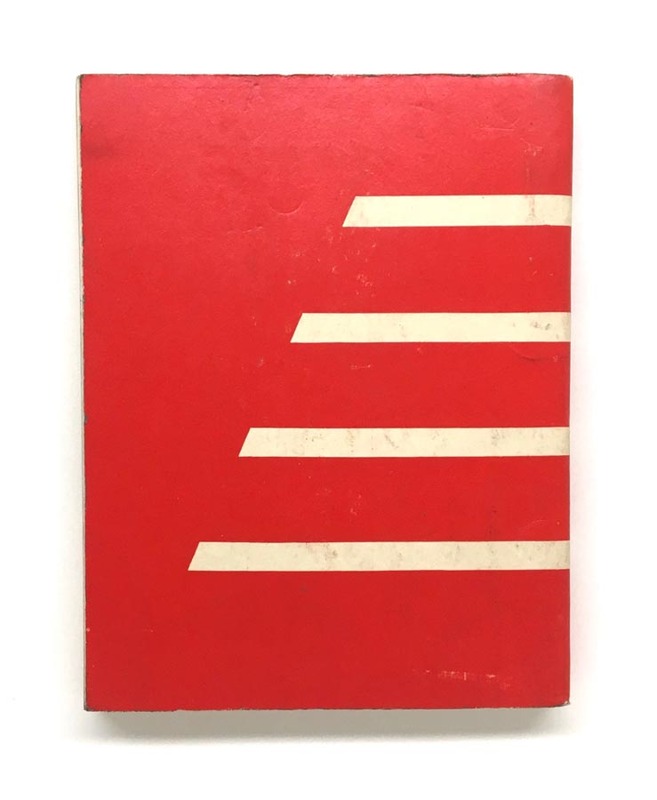 Binding is tight. 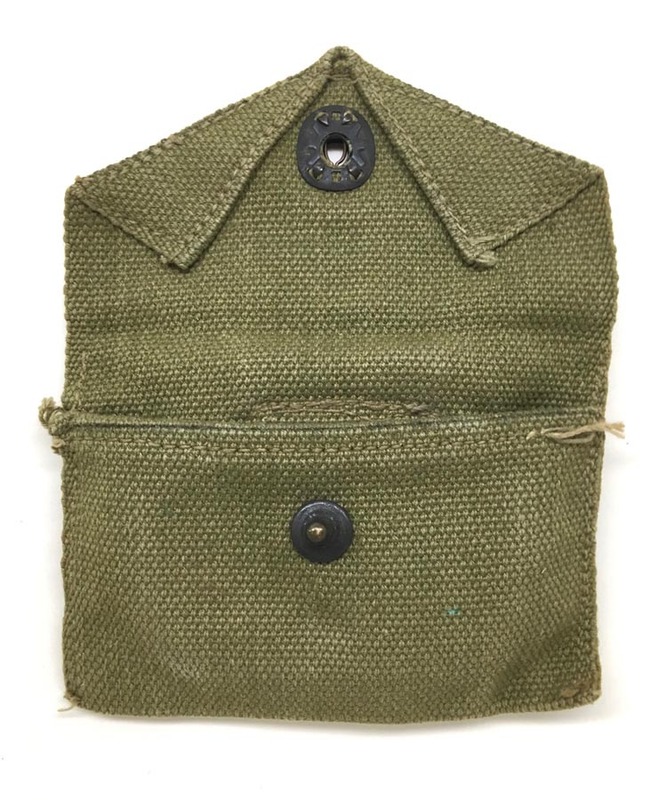 PHYSICAL DESCRIPTION: This WW2 US Army First Aid Pouch & Carlisle Bandage are in nice condition. 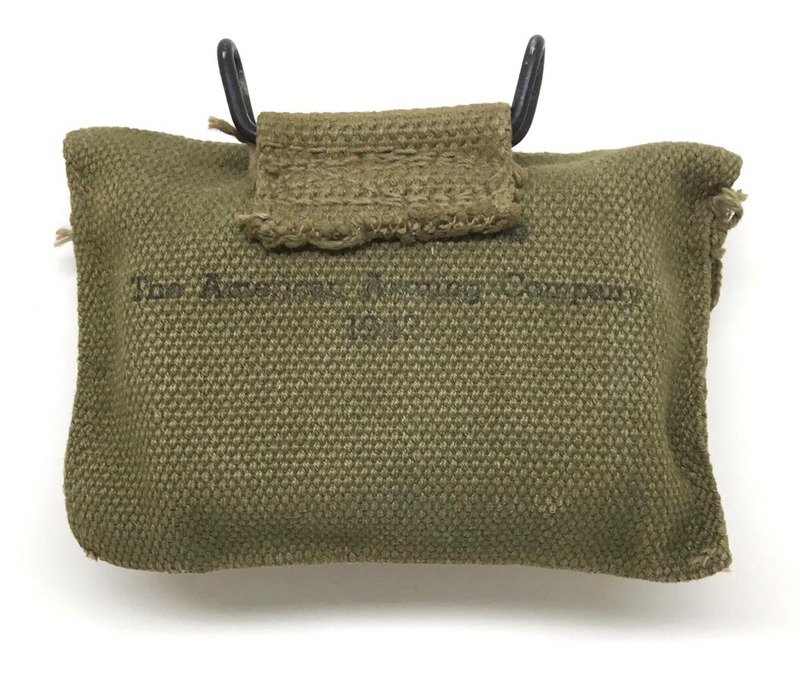 Canvas pouch is in excellent condition and ink stamped: The American Awning Company 1942. 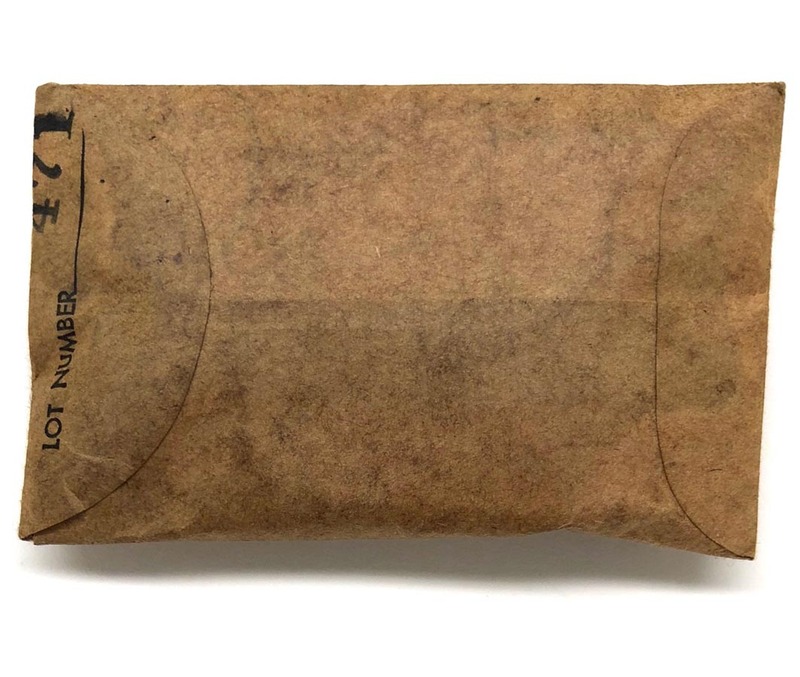 Carlisle Bandage shows some dings and dents. 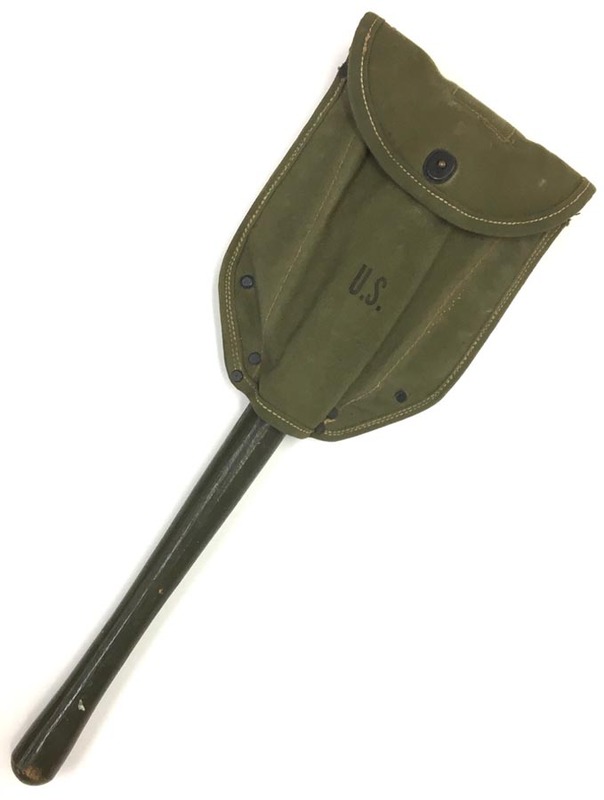 PHYSICAL DESCRIPTION: This WW2 US Entrenching Tool Shovel & Cover are in nice condition with no damage. 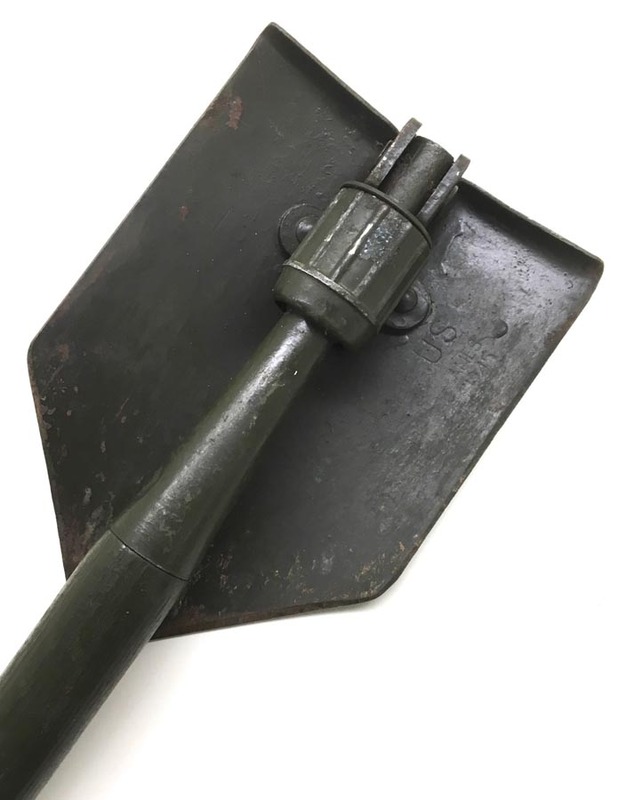 The shovel is US Ames 1945 marked. 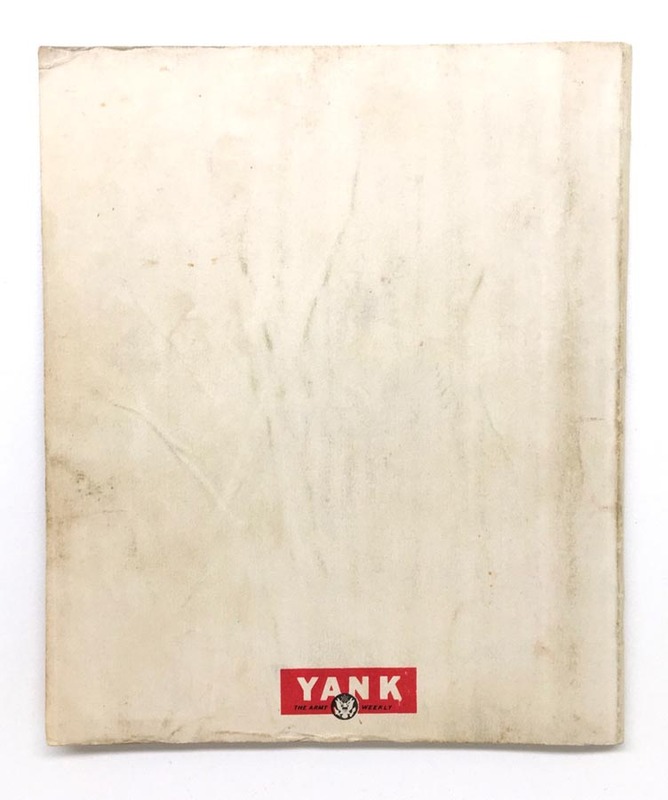 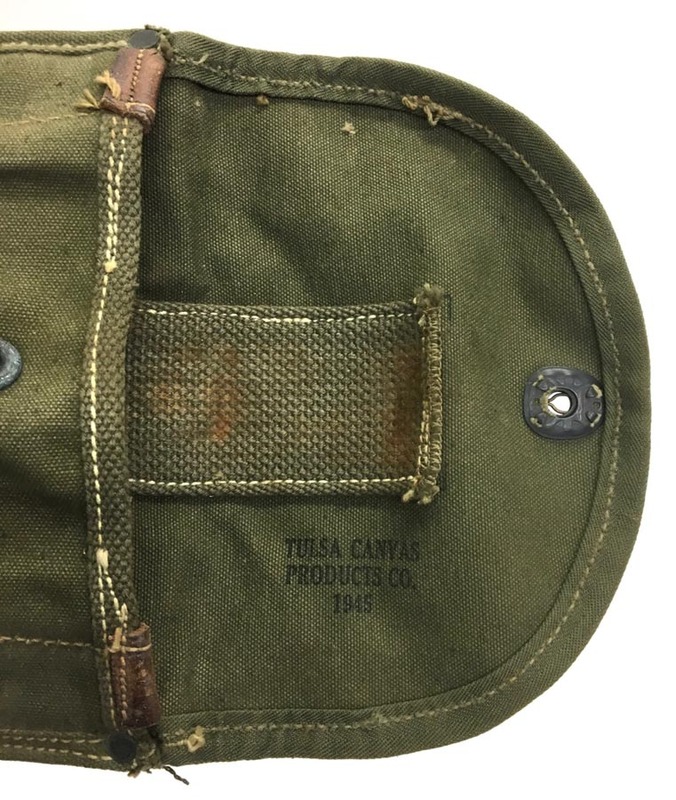 The Canvas Cover is ink stamped: Tulsa Canvas Products Co. 1945. 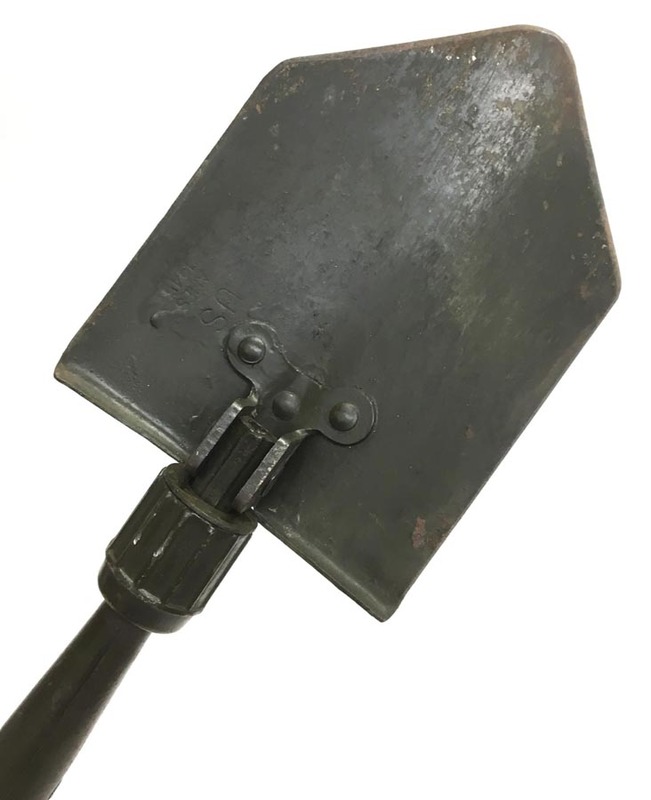 Shovel opens and closes easily. 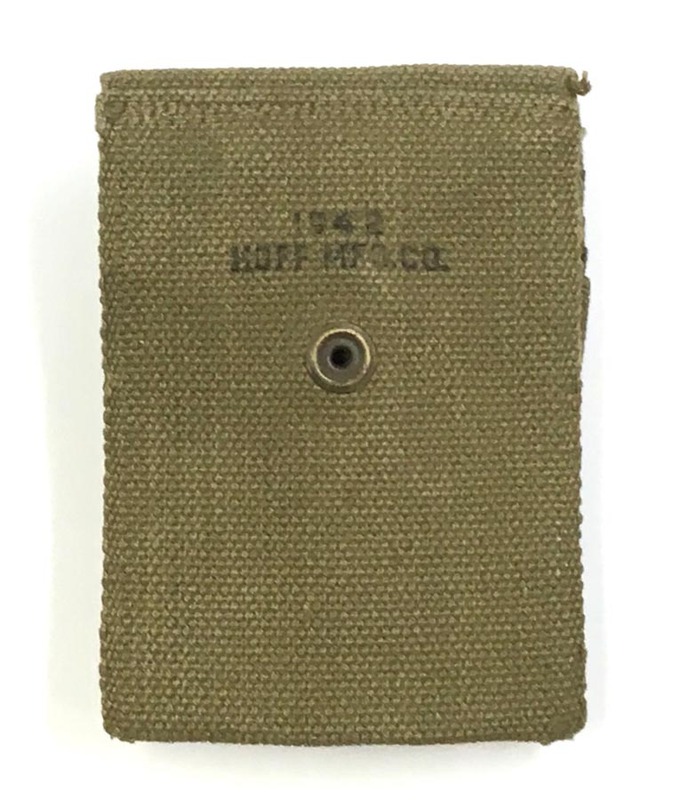 Canvas cover snap functions great. 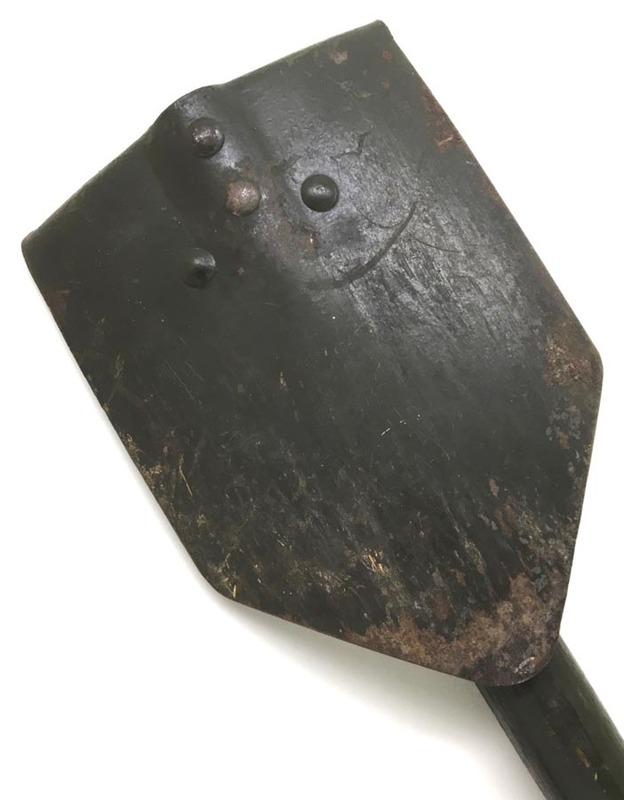 Shovel shows some wear towards tip area. 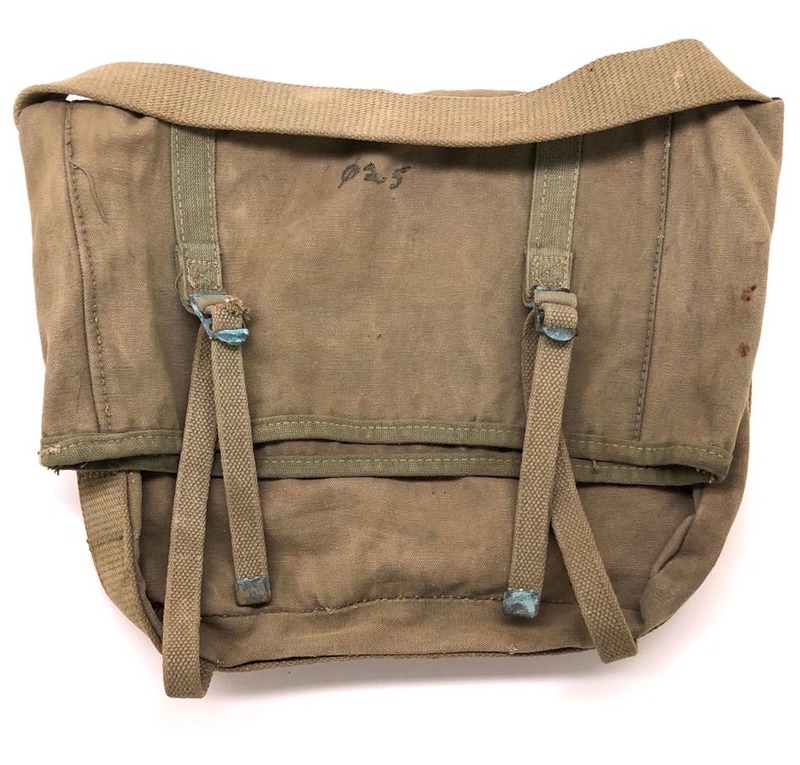 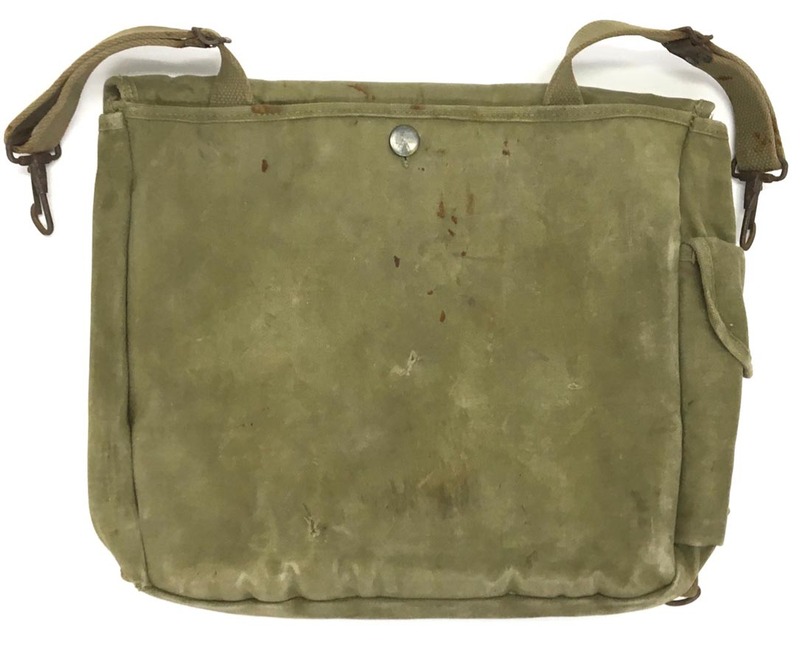 PHYSICAL DESCRIPTION: This WW2 US Army Musette Bag is in solid condition showing some wear. 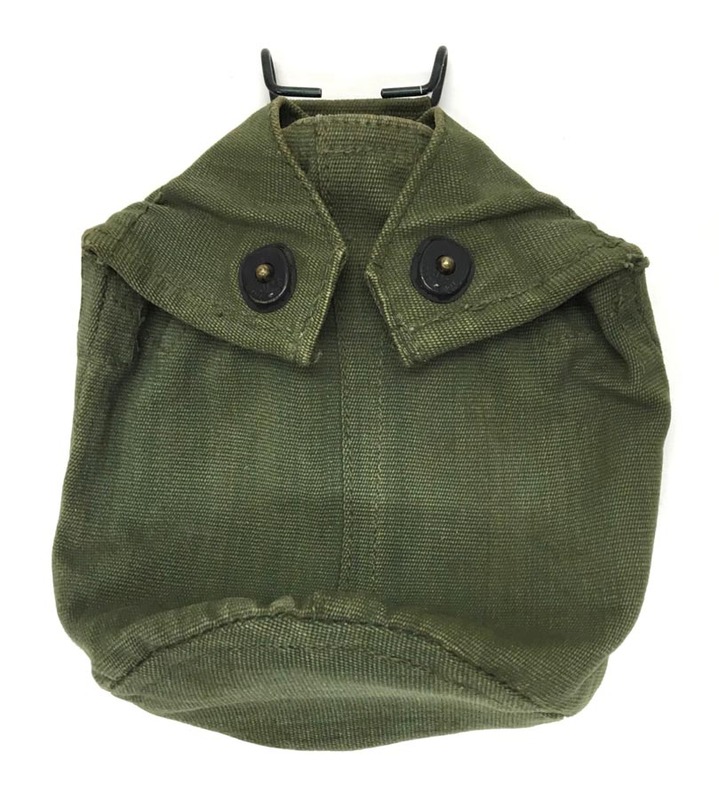 All buttons,straps and buckles are present. 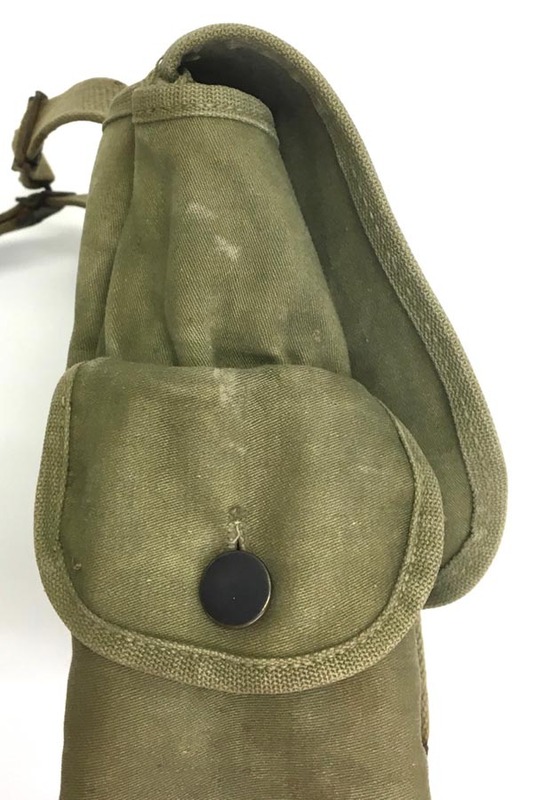 Bag has two small holes to back about 1/4 inch in size. 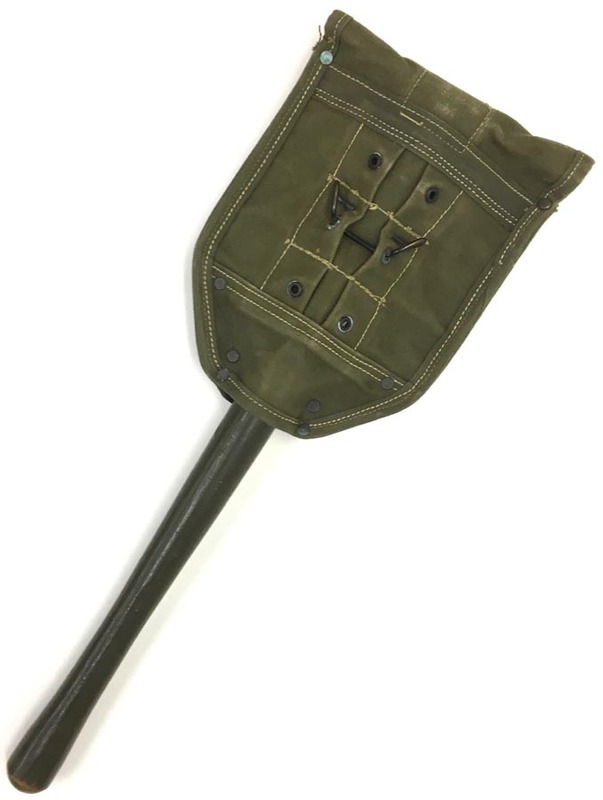 Hardly noticeable. 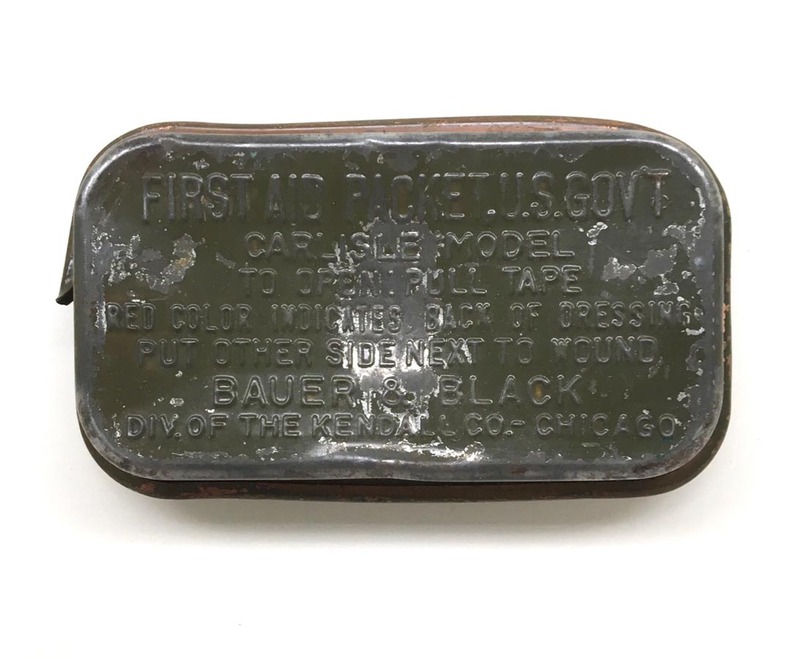 Buckles and clips show some rust. 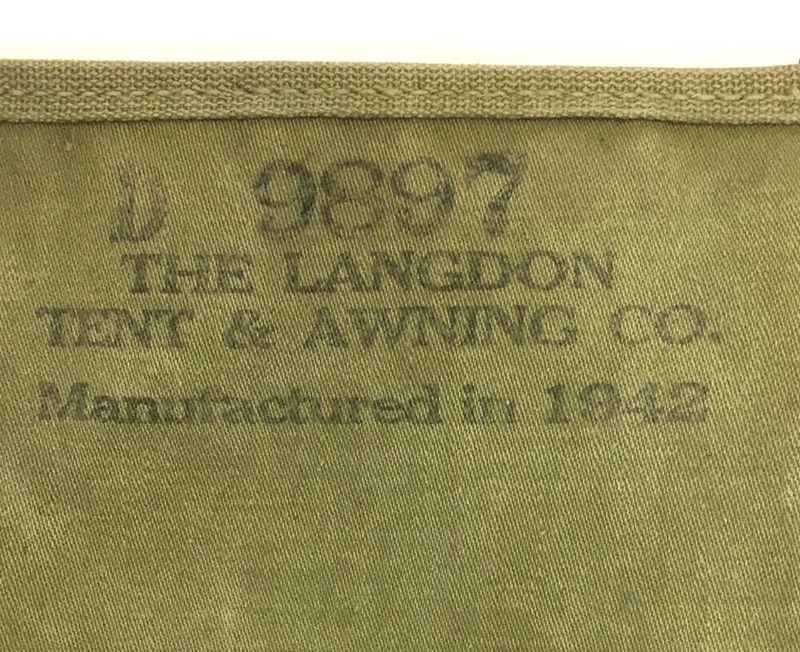 Bag is maker marked and dated: The Langdon Tent & Awning Co. 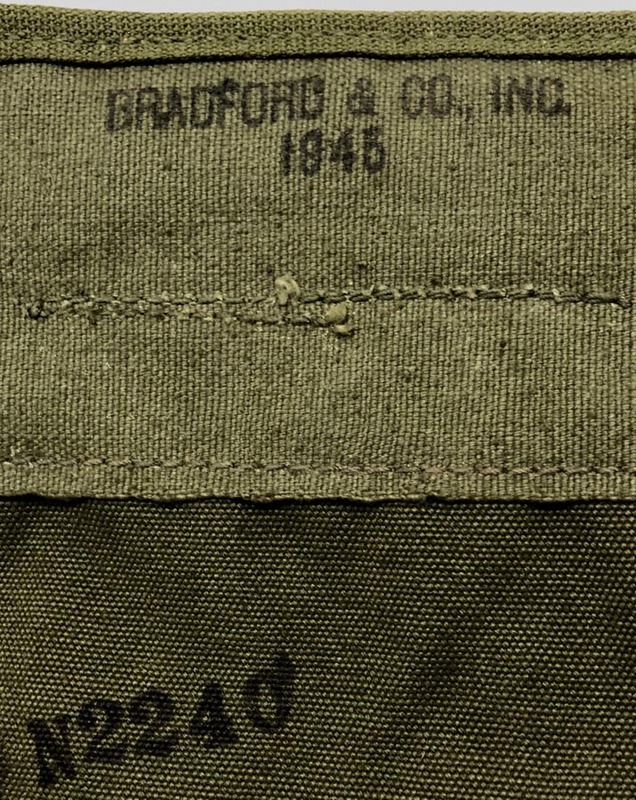 Manufactured in 1942. 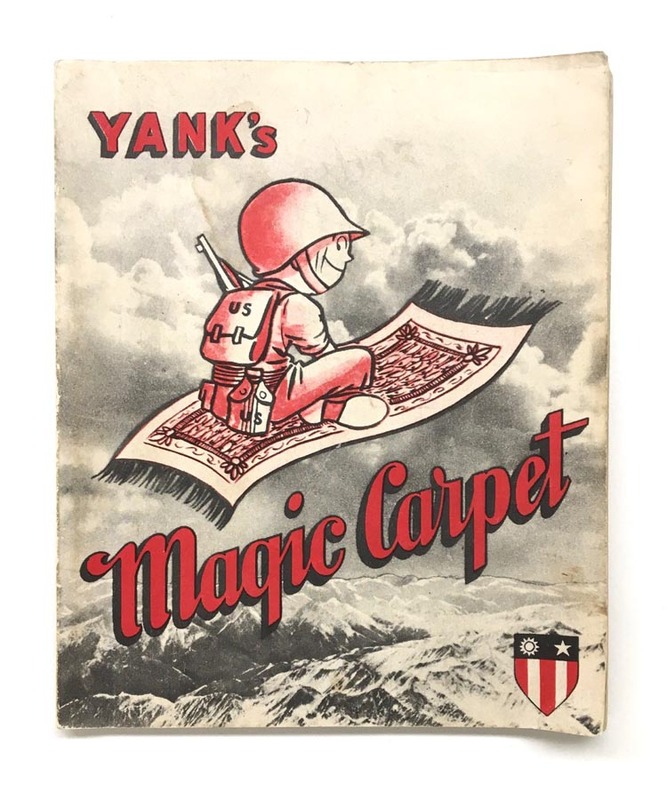 PHYSICAL DESCRIPTION: This YANK'S Magic Carpet C.B.I. 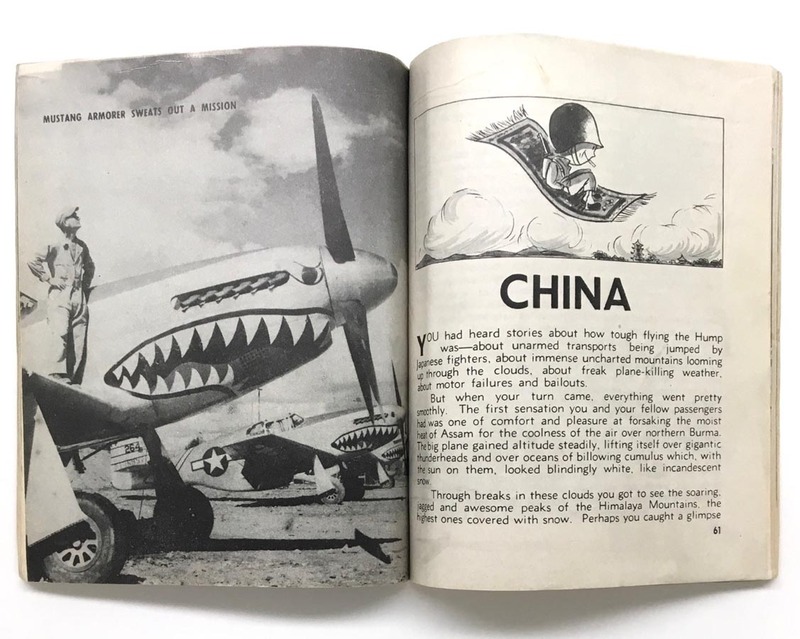 Souvenir Booklet is in nice condition with no torn or loose pages. 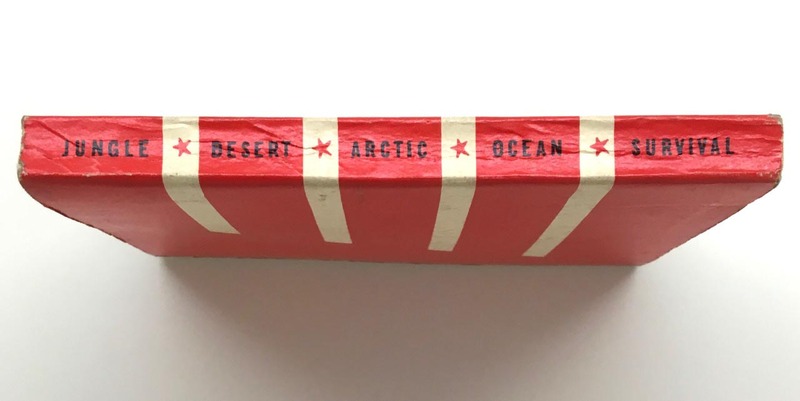 Binding is tight. 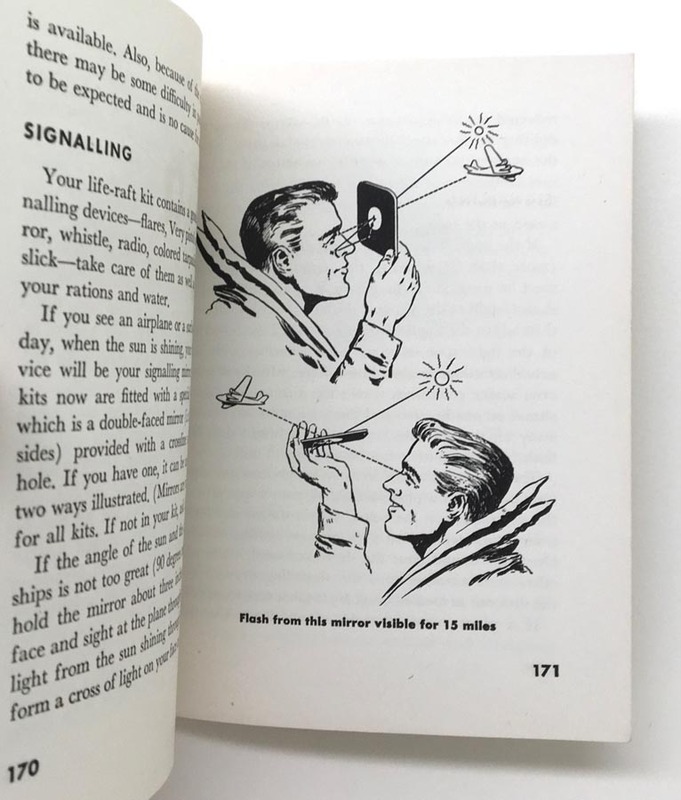 Booklet has all 93 numbered pages. 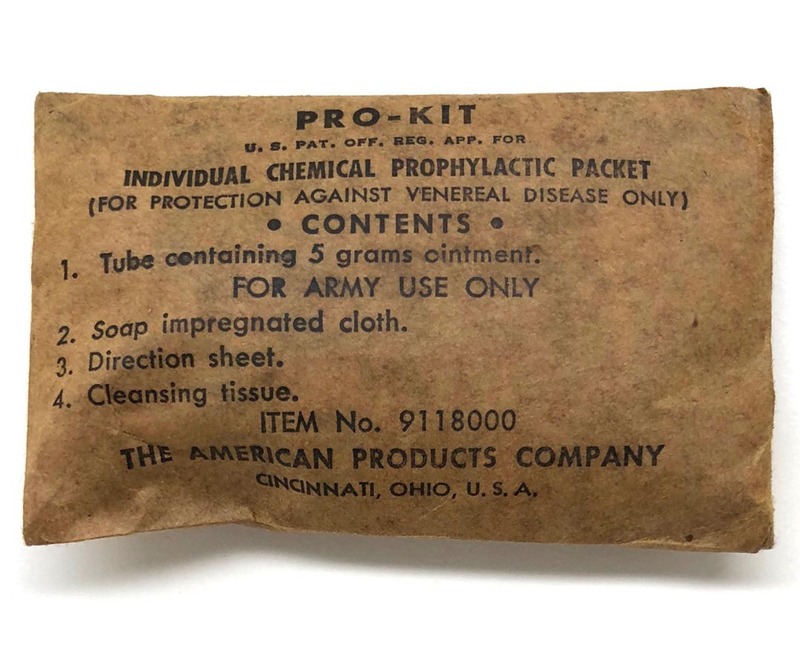 PHYSICAL DESCRIPTION: This WW2 US Army Issue Pro-Kit Chemical Prophylactic is in real nice unopened condition. 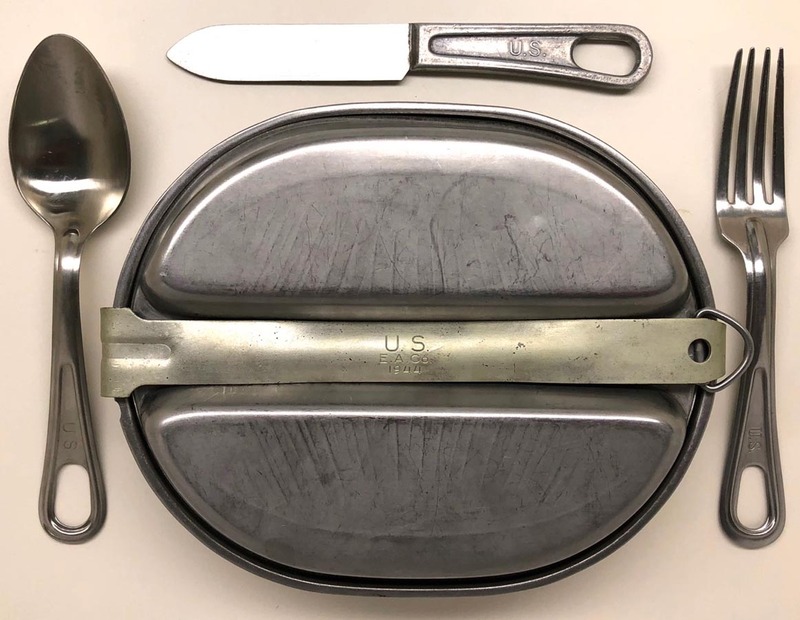 PHYSICAL DESCRIPTION: This WW2 US Army Mess Kit & Utensils are in real nice condition. 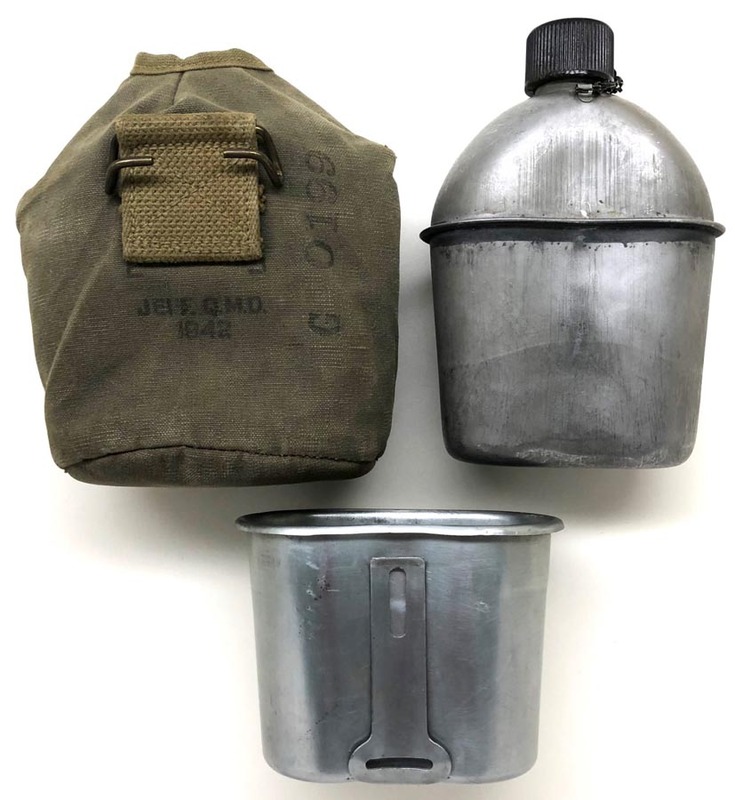 Mess kit is 1944 dated. 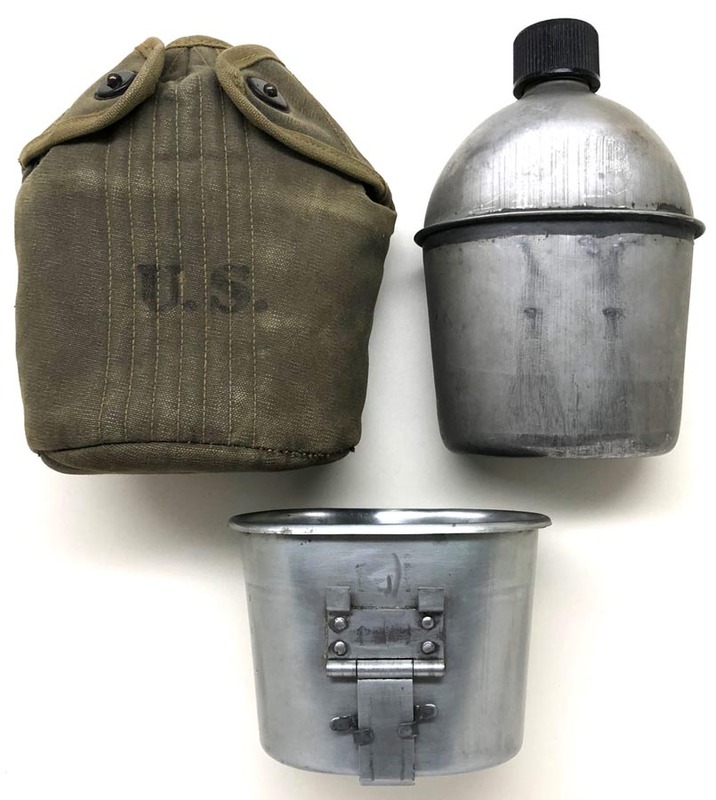 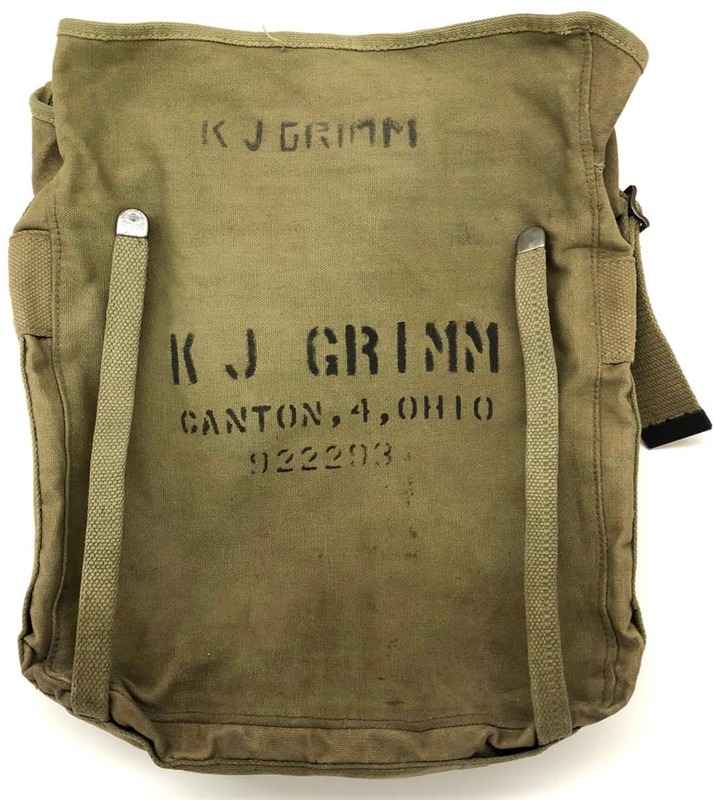 PHYSICAL DESCRIPTION: This WW2 US Army Canteen, Cup & Cover are in real nice condition. 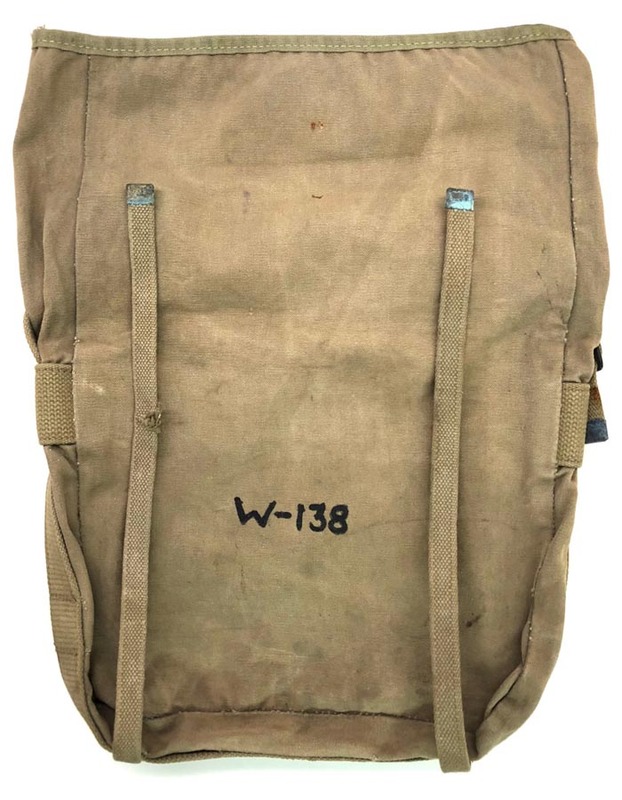 Canteen is dated 1944 and is real nice. 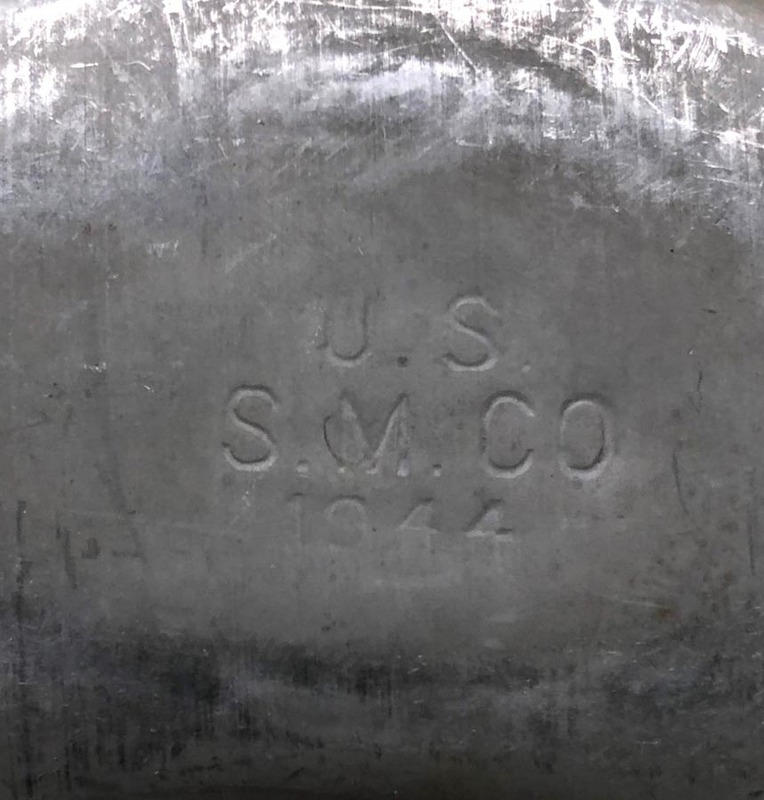 Cup is dated 1942 and is also very nice. 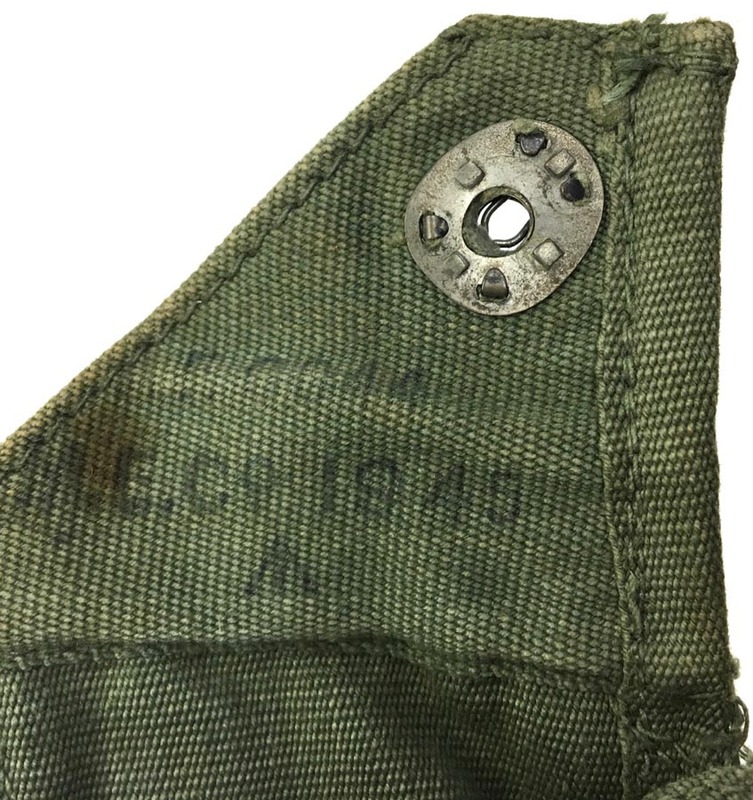 Cover is dated 1942 and shows no tears or damage, just some light normal wear. 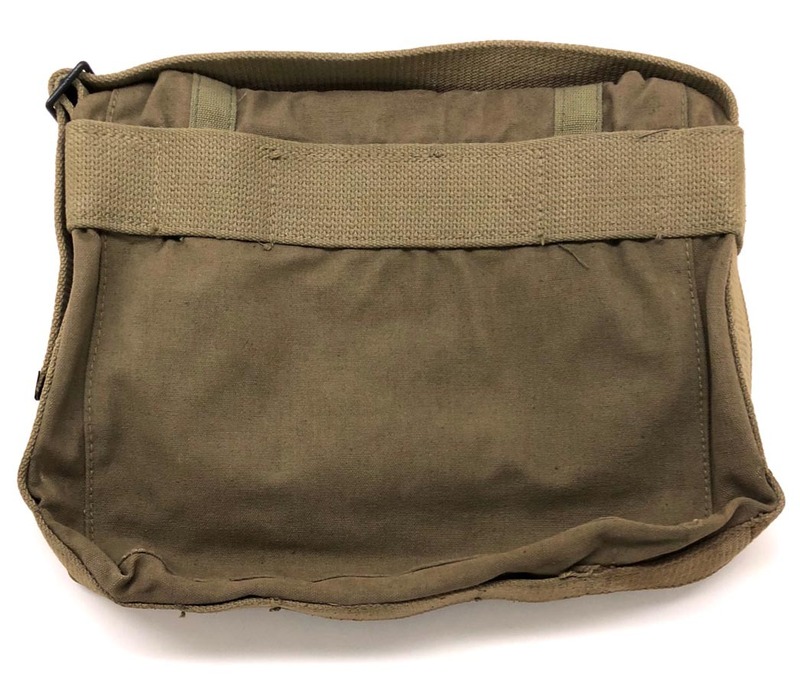 Snaps to cover function great. 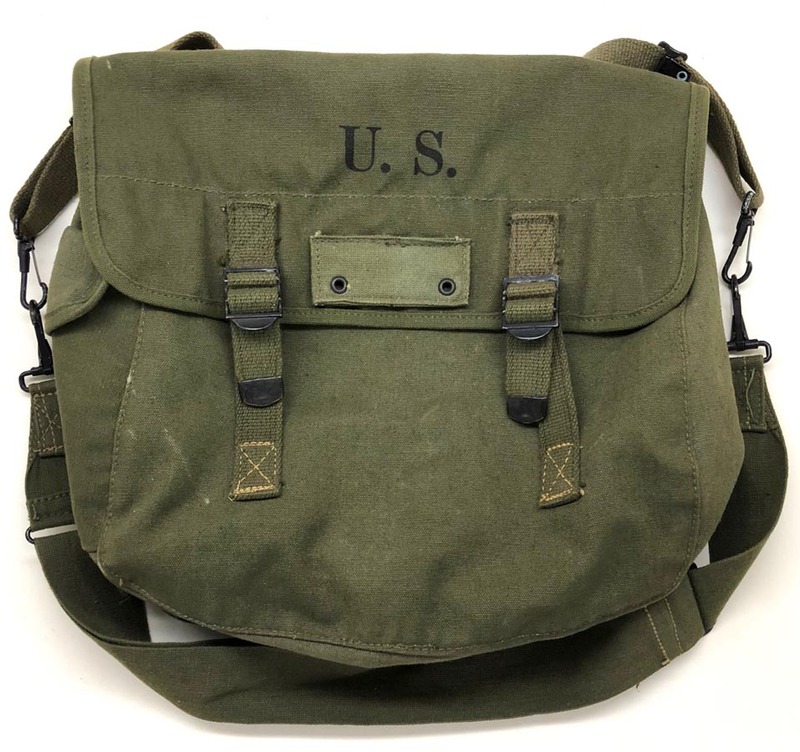 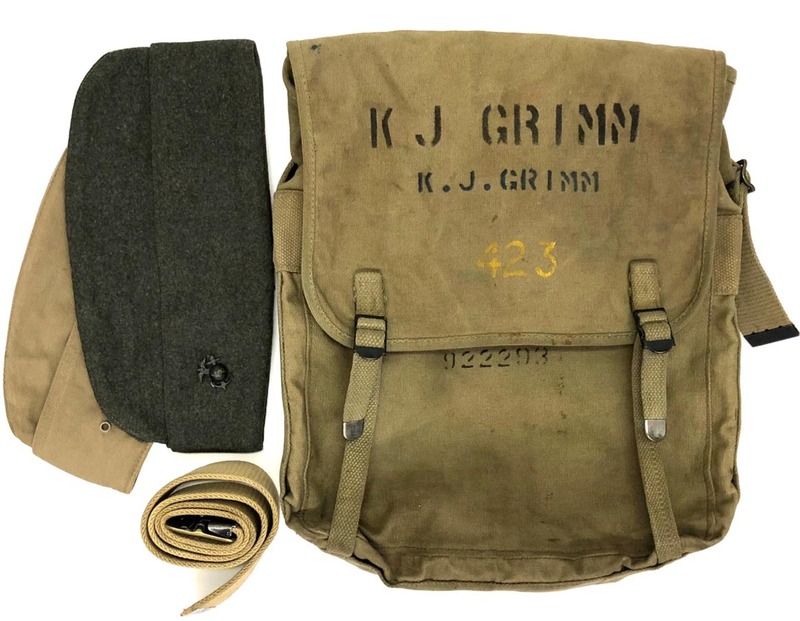 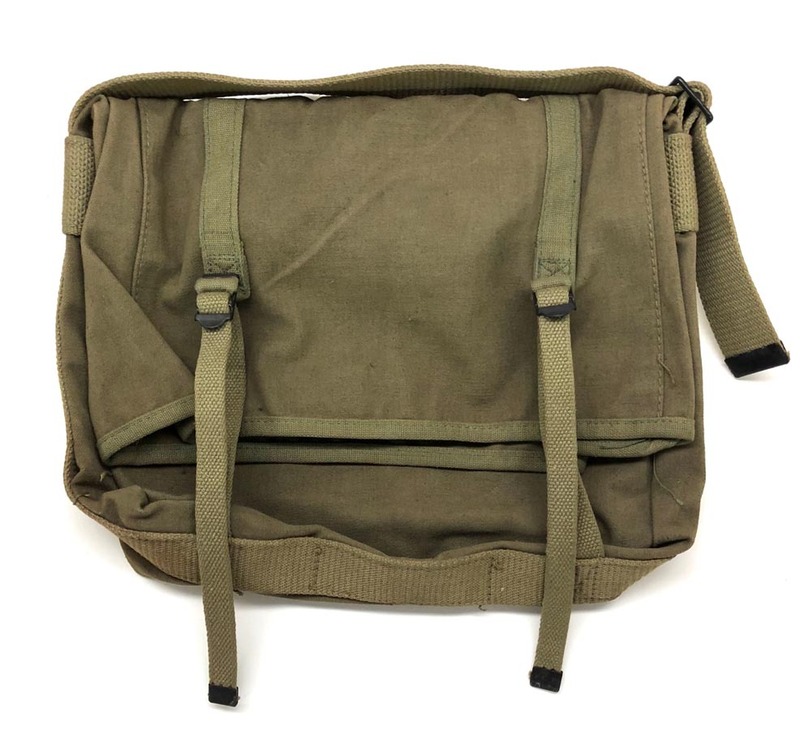 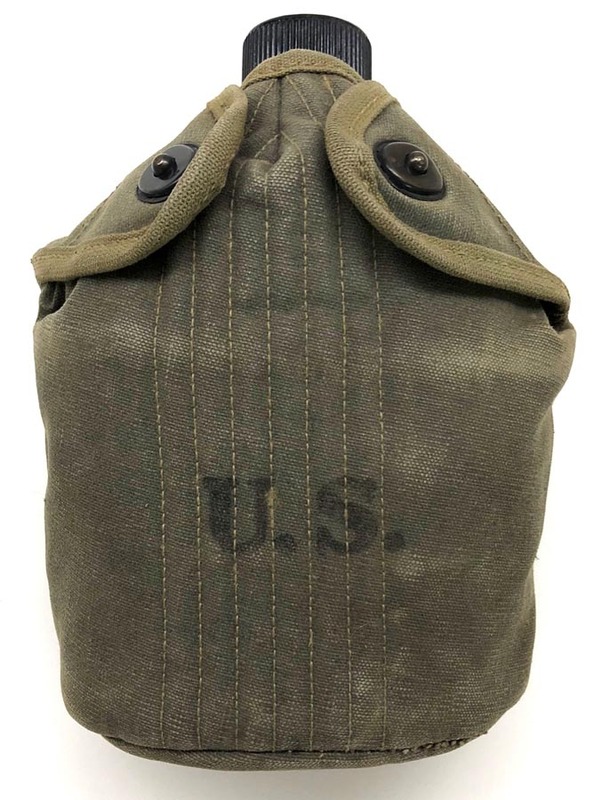 PHYSICAL DESCRIPTION: This WW2 US Army Musette Bag is in excellent condition with no damage. 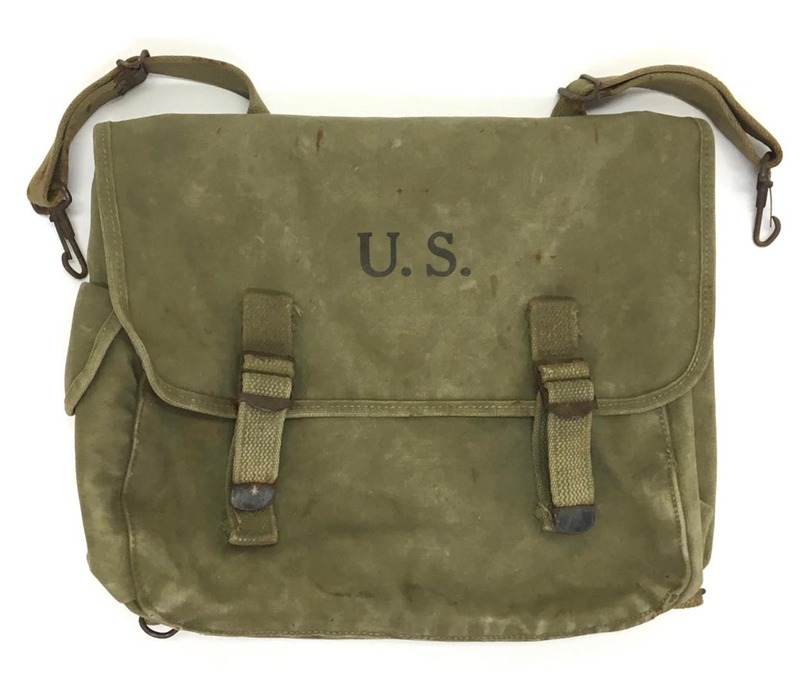 Both bag and strap are both 1945 dated. 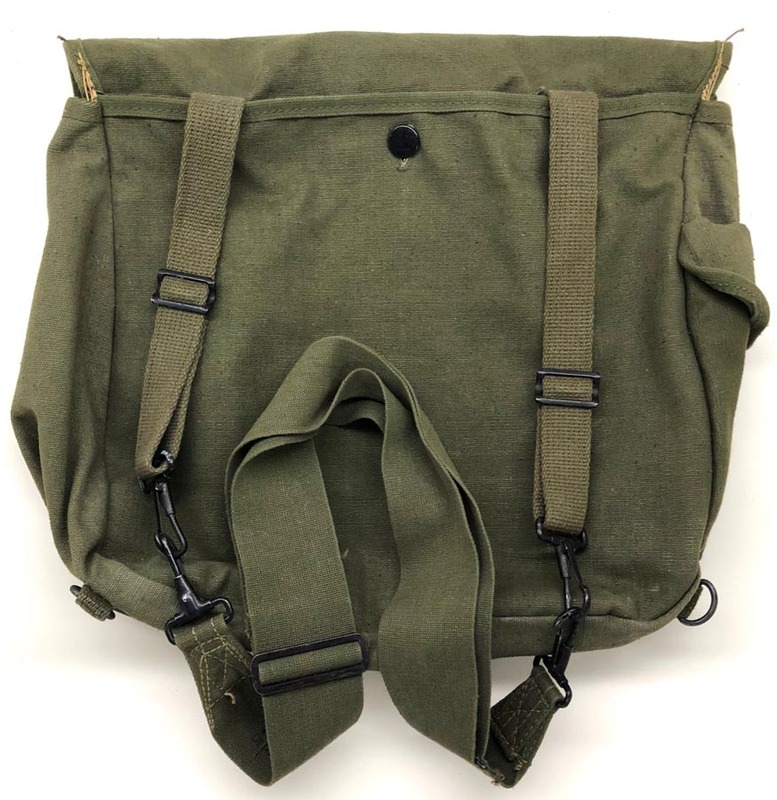 All buttons and straps are present. 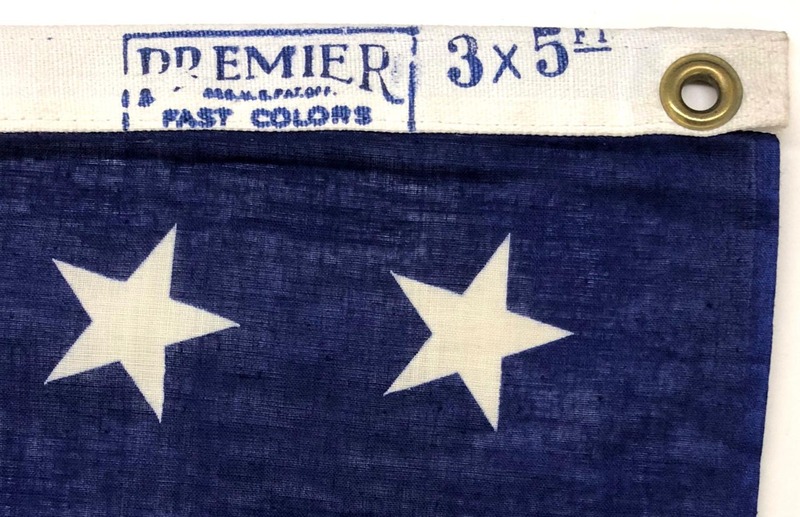 PHYSICAL DESCRIPTION: This 48 Star U.S. 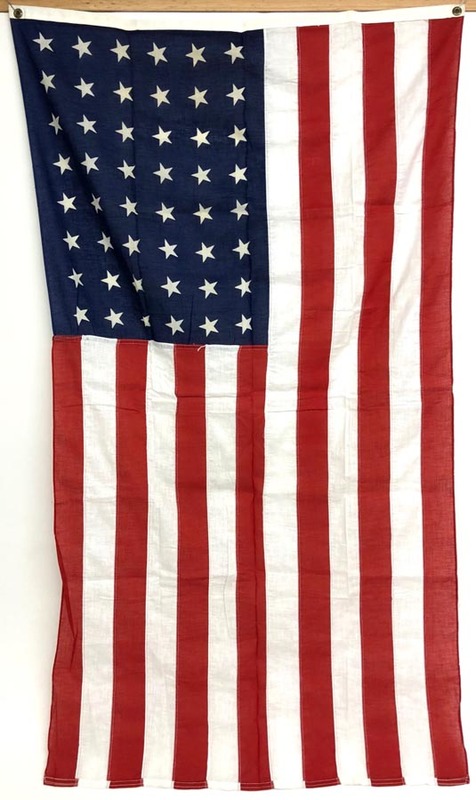 Flag is in excellent unused condition. 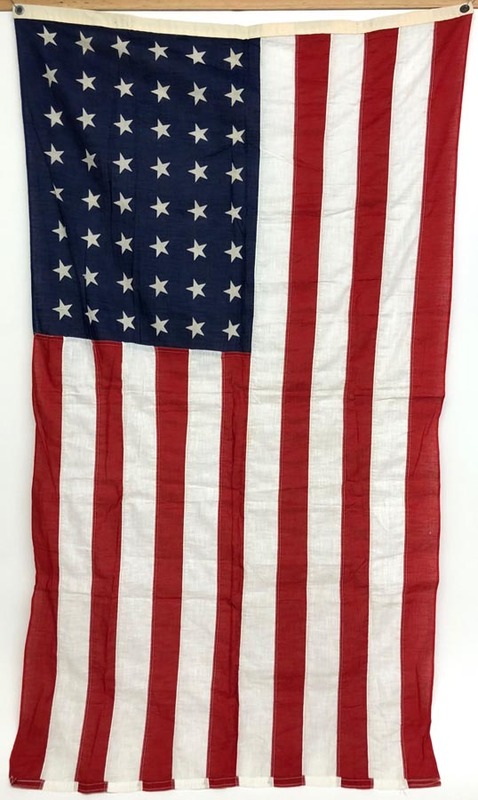 U.S. 48 Star Flag 2'8"X 4'8"
PHYSICAL DESCRIPTION: This U.S. 48 star Flag is in nice condition showing some age and wear. 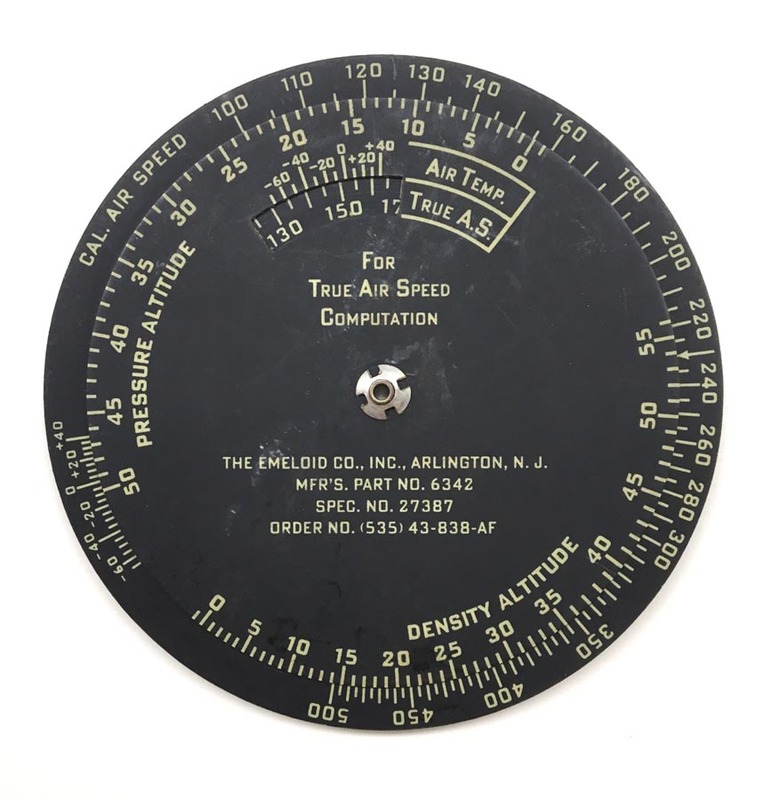 There are a couple of small 1/8" size holes. 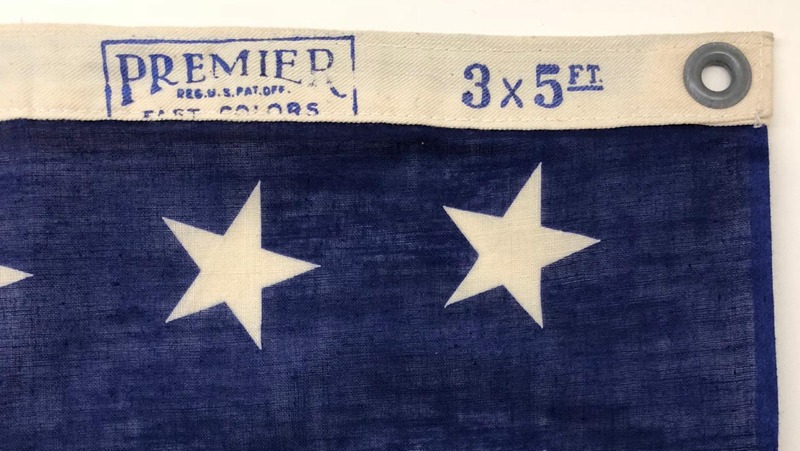 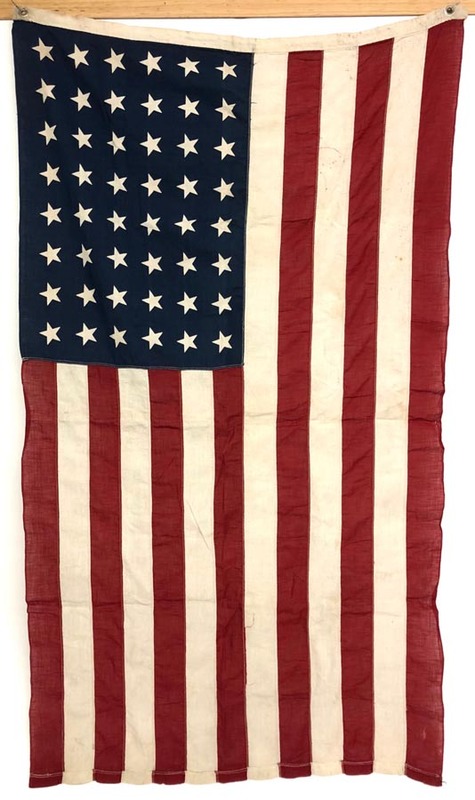 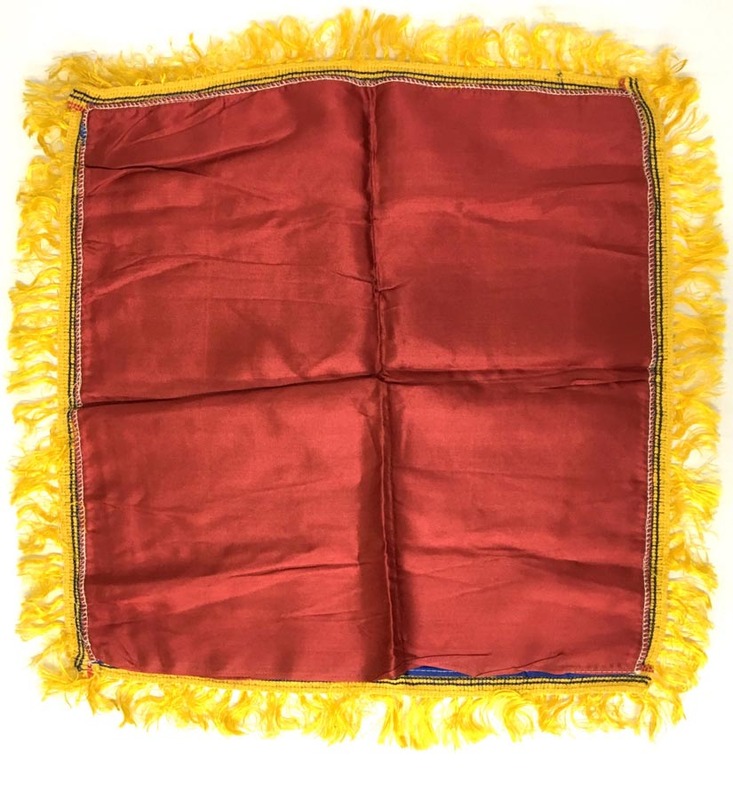 PHYSICAL DESCRIPTION: This U.S. 48 Star Flag is in excellent unused condition. 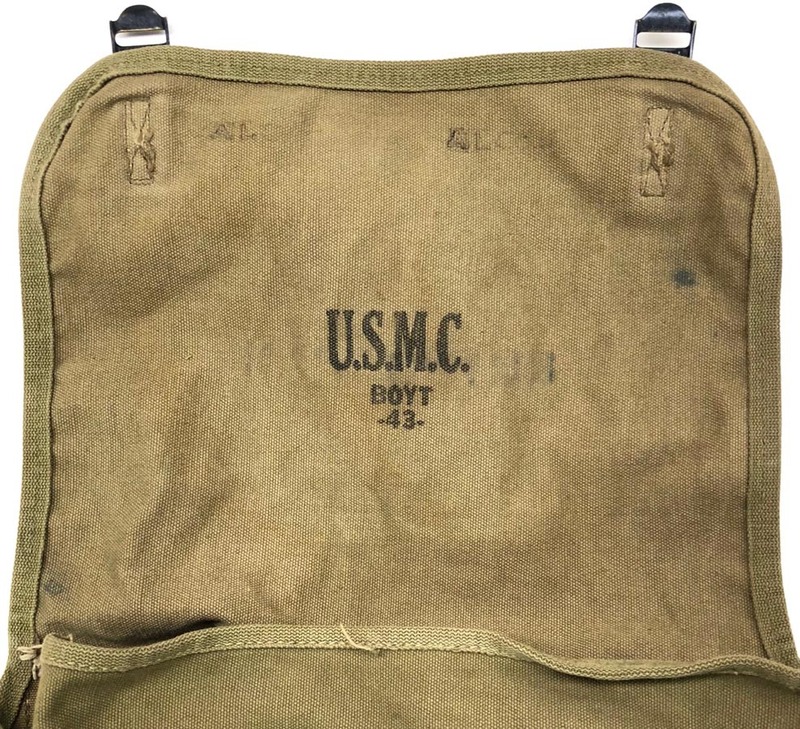 PHYSICAL DESCRIPTION: This WW2 US Marine M-41 Lower Pack is in excellent condition with no damage whatsoever. 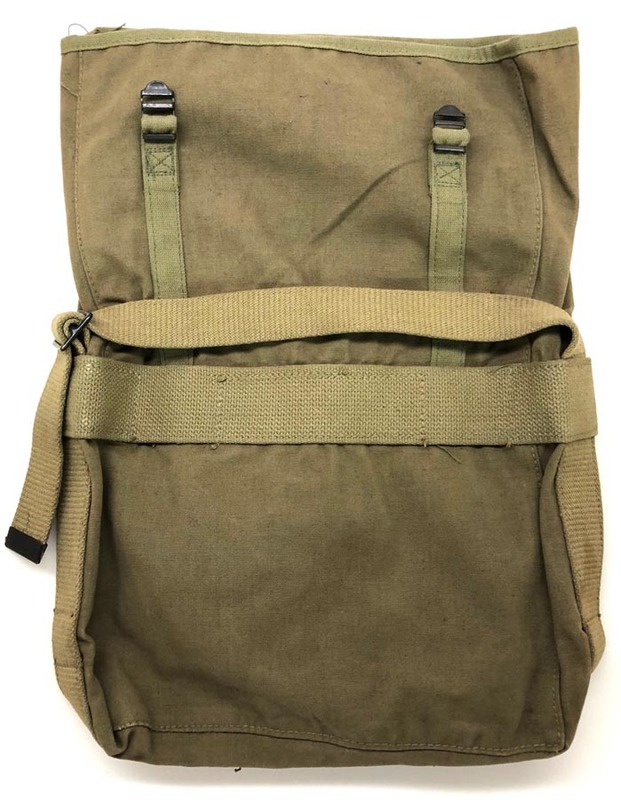 All straps are nice and function perfectly. 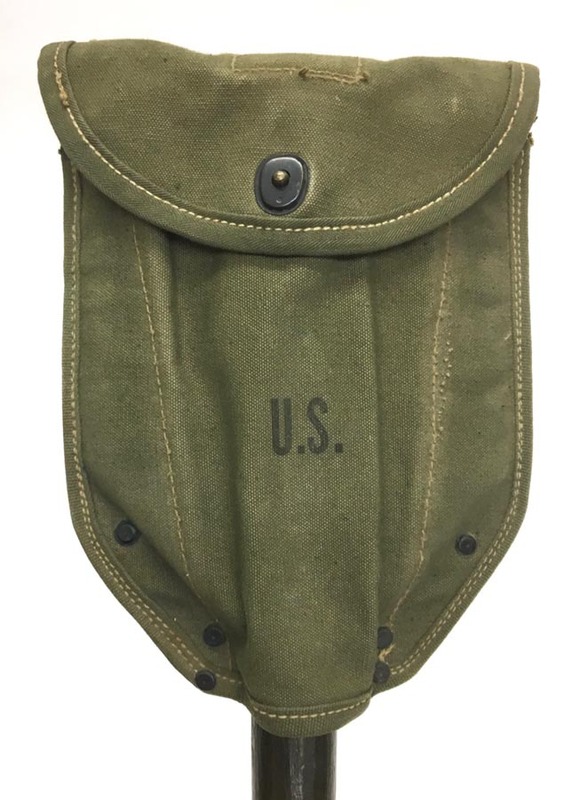 PHYSICAL DESCRIPTION: This WW2 US Marine Lower Pack, Overseas Caps and Belt are in nice condition showing some wear. 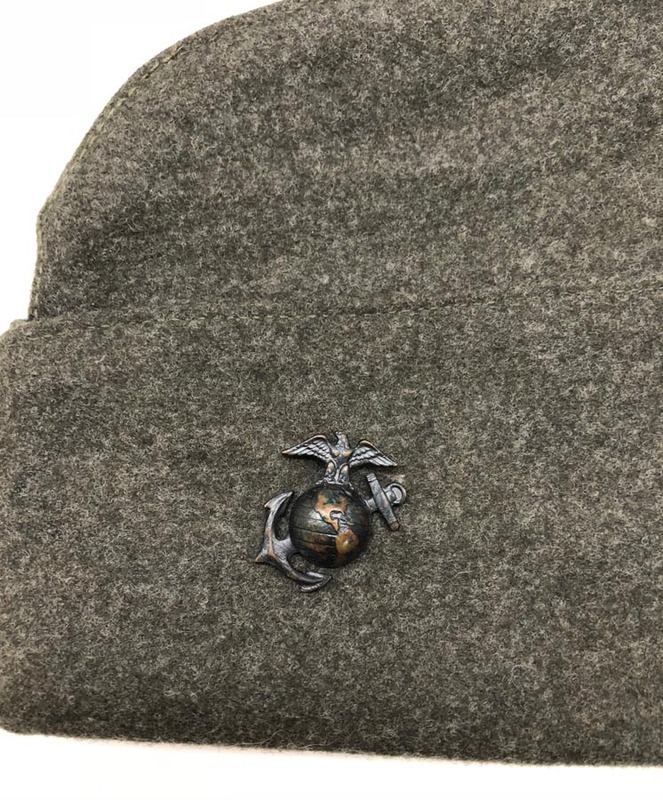 Caps are both nice with the green having it's EG&A. 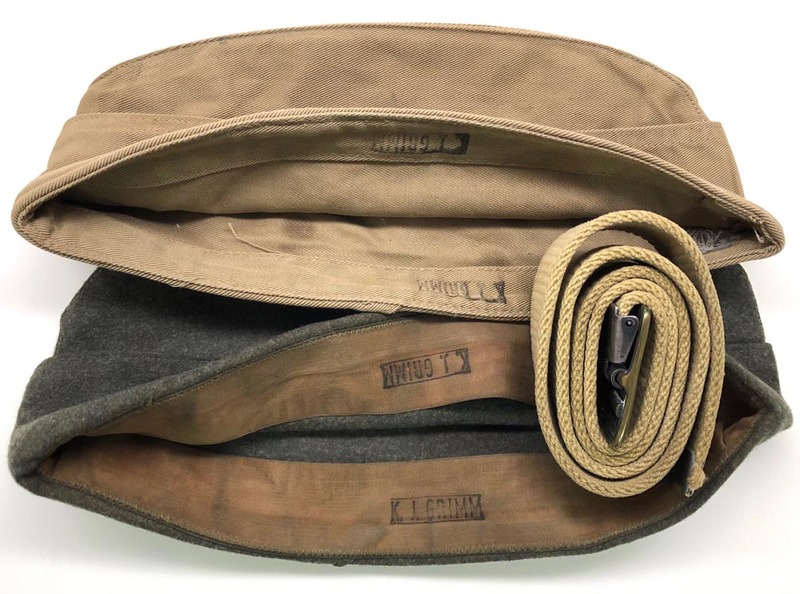 Belt is also nice showing some wear. 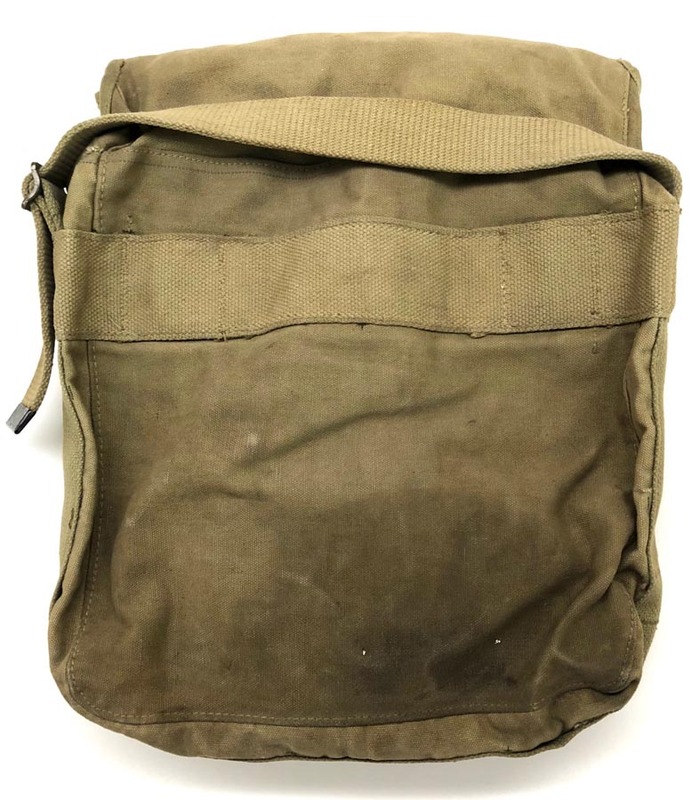 Pack is nice showing some soiling but no damage. 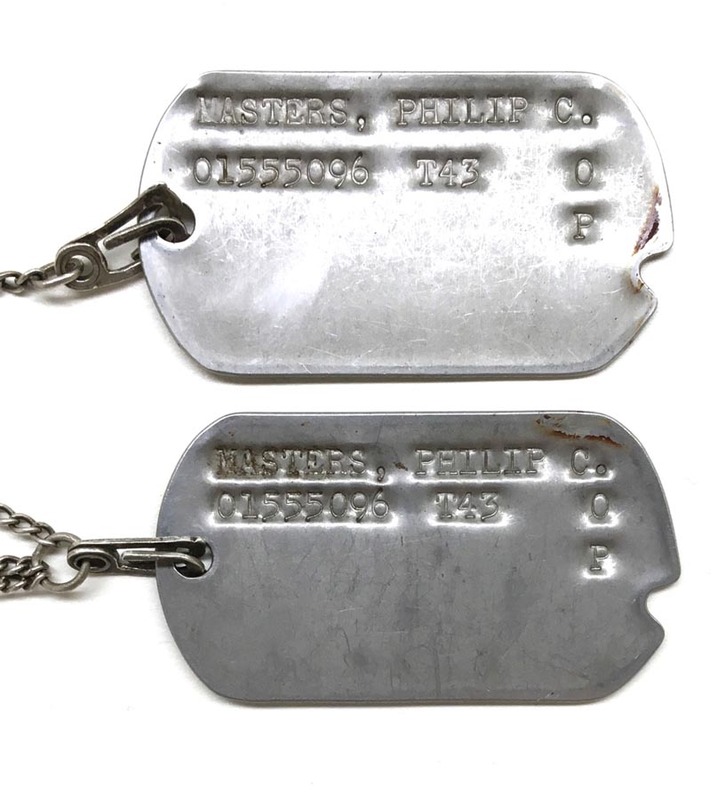 Both pack and caps are named to the original Marine. 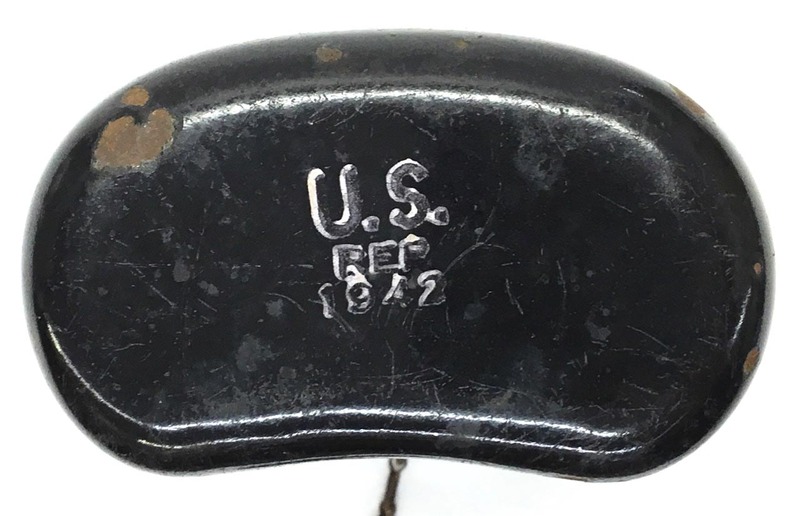 PHYSICAL DESCRIPTION: This WW2 U.S. Marine M-41 Lower Pack is in fair condition showing some wear, age and soiling. 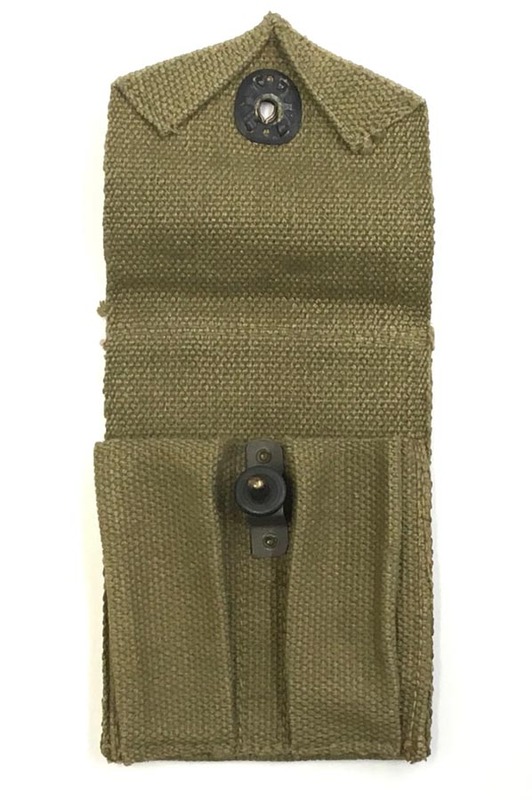 All straps are present. 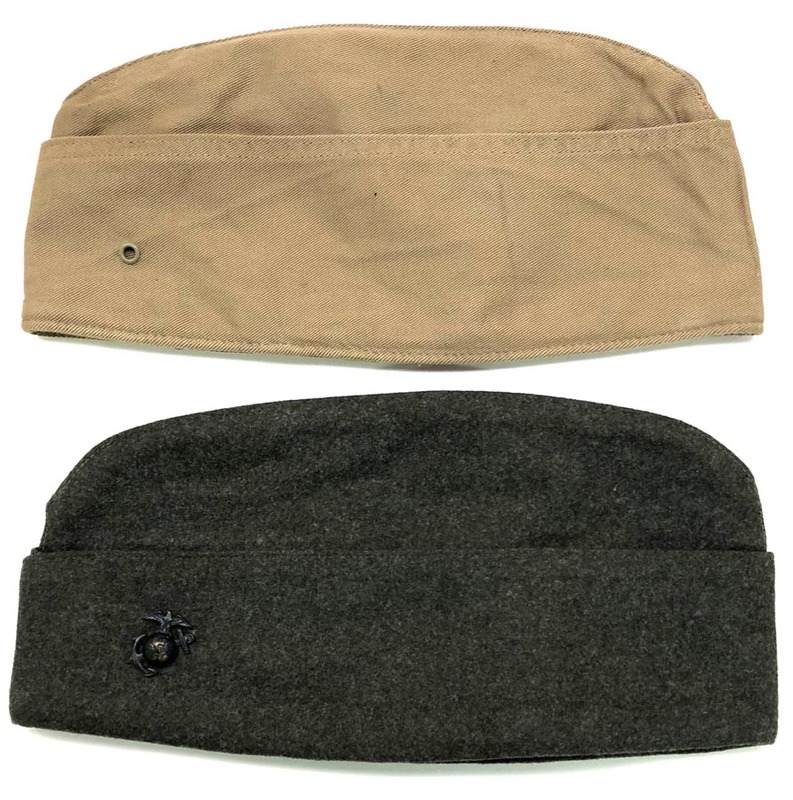 One small strap shows a little fraying but is still very solid. 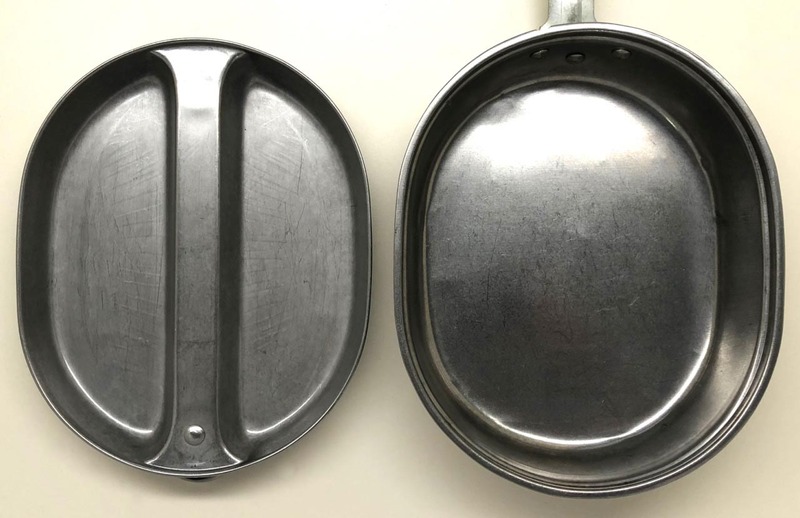 No other holes or damage. 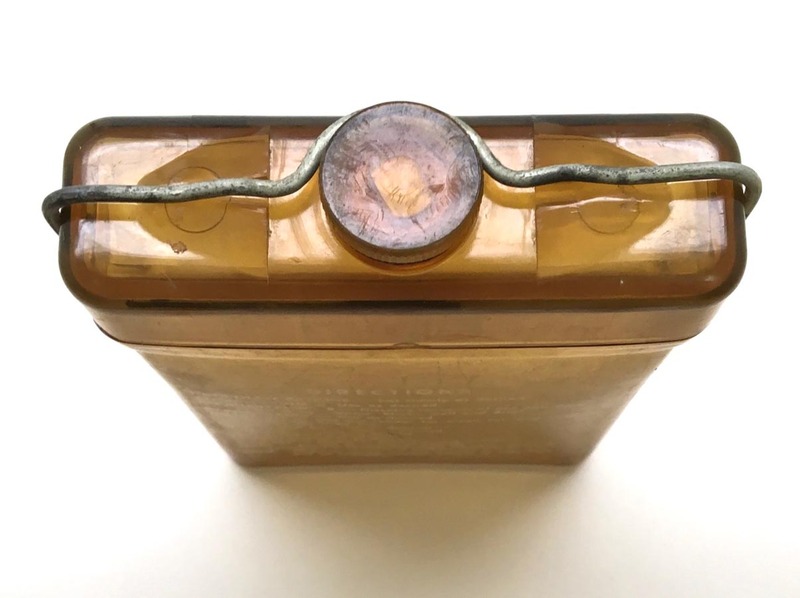 Metal ends to buckles show some vertegre, will clean up.